We were thinking about holidays 2013 for a long time. Finally after discussing many options we decided to spend over a month in the USA, mostly in California, sharing time between tourism and minerals. 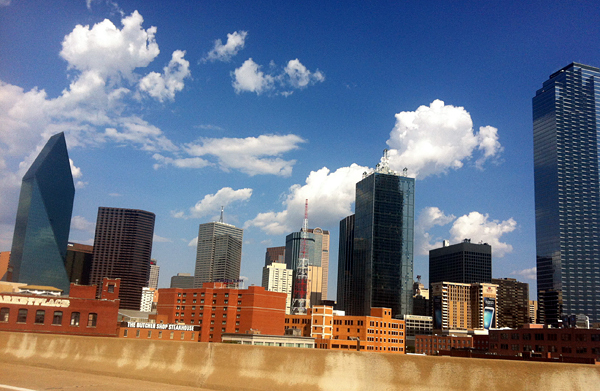 We flew from Warsaw though Frankfurt to Dallas to participate in Dallas Mineral Collecting Symposium. It was kind of last minute idea given by Bill Larson. And we didn`t regret changing our plan in the last moment. 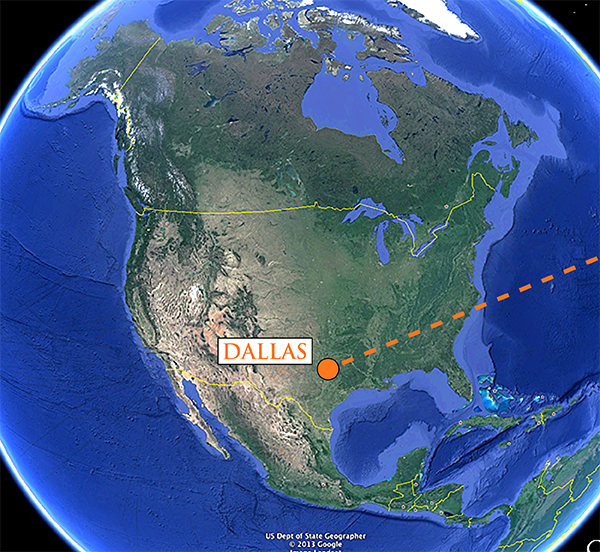 Dallas is located in the desert of Texas with super modern skyscrapers, extremely wide highways and completely no place for human beings. No sidewalks, no pedestrian crossings, no downtown where you can walk. It looks like the city was designed only for cars. For us it was a very interesting experience as we are used to European cities which are very different. 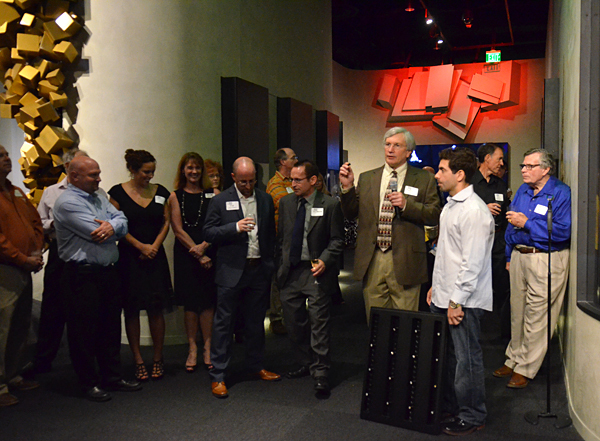 First evening after arrival we attended the opening party in Perot Museum of Nature and Science. 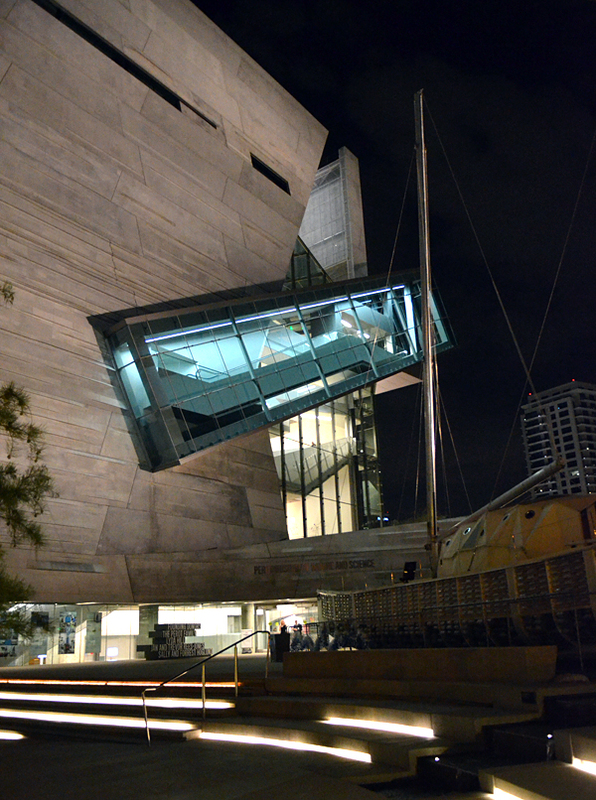 We really liked the modern architecture of the museum`s building and its content! 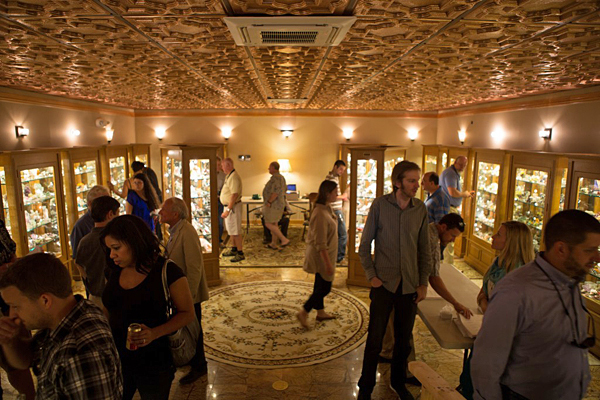 There were crowds of collectors in the Gem and Mineral Hall, great drinks and snacks and of course incredible minerals. We spent a lot of time admiring superb specimens displayed in a very aesthetic way. There were great rarities as well as enormous gem crystals and reconstructions of the pockets. One of the most amazing and at the same time simple ideas was a huge geode of amethyst from Brazil that one could open and close on their own using a big wheel. Great way to explain to kids how pockets look like before you open them. We also liked the cool idea of showing Naica mine – there was a cavity with gypsum crystals and small people walking among the crystals (displayed on the screens hidden inside the cavity). It showed very well the scale of Naica. We loved the museum and we hope to get back there in the future. Next day we went to listen to the presentations which took almost the whole day. Great selection of topics and speakers made the day very interesting. We were also distributing the new issue of MINERALS newspaper which was very well received. You can read more about the symposium here. 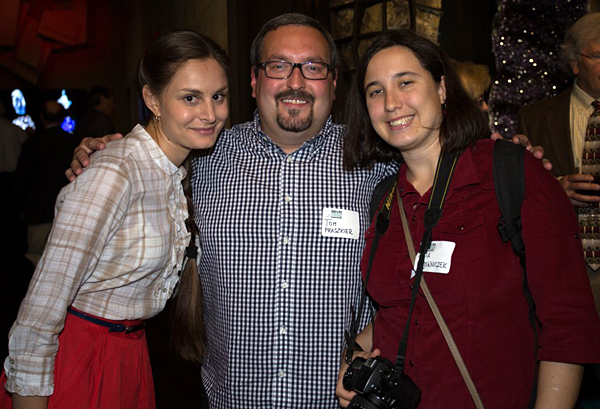 The evening (as well as the whole event) was another great opportunity for chatting with friends and getting to know new people from the mineral community - this time party was hosted by Rob Lavinsky in his gallery. Impressive venue, a lot of superb minerals. I spent almost whole evening digging through the drawers where I found several sleepers as well as unusual, rare specimens. 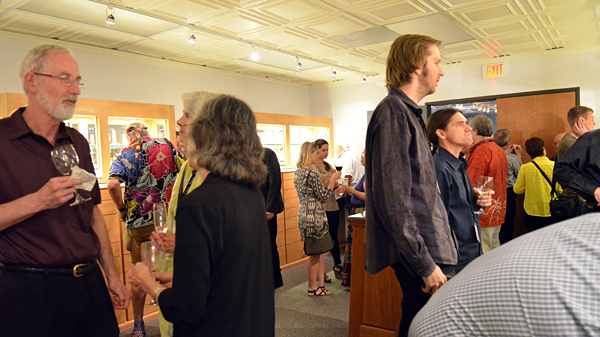 Next day started with an open day in the gallery that was followed by another wonderful social event - Spann`s Soiree. Gail and Jim Spann hosted this event for the 6th time. 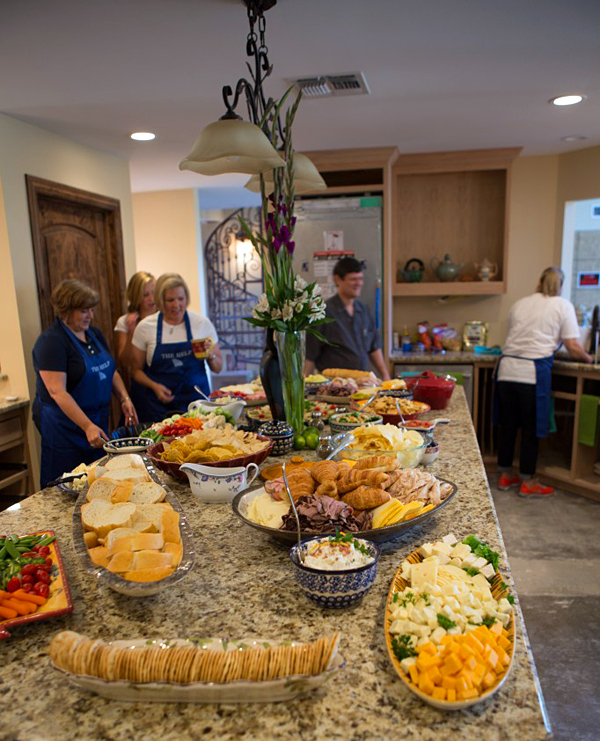 Apart from delicious food, drinks, and many friends, the main attraction was the opportunity to see the collection of Gail and Jim. 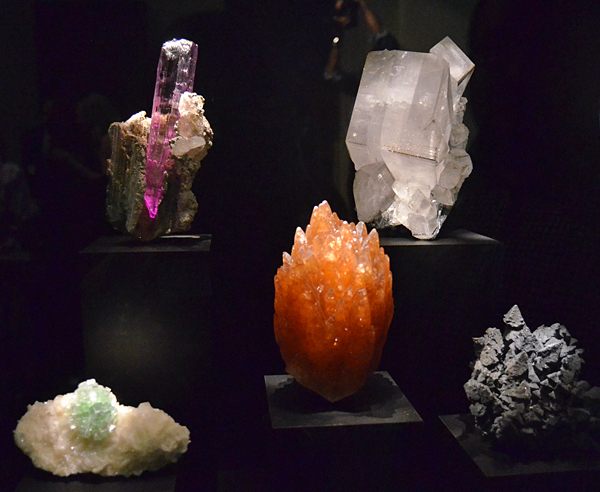 Visiting their house is more like visiting a mineralogical museum. Their enormous collection is displayed in tens of cabinets, it includes hundreds of world class specimens as well as rare species and curiosities. Pieces range from museum size to almost micromounts. Impossible to see everything in one day! Great blue-caps, but also great sperrylites, superb fluorites, but also arfvedsonites, "ugly" acanthites and colorful pyromorphites. Everyone will find something interesting. I wish they open a museum once, so everyone has an opportunity to see the collection. 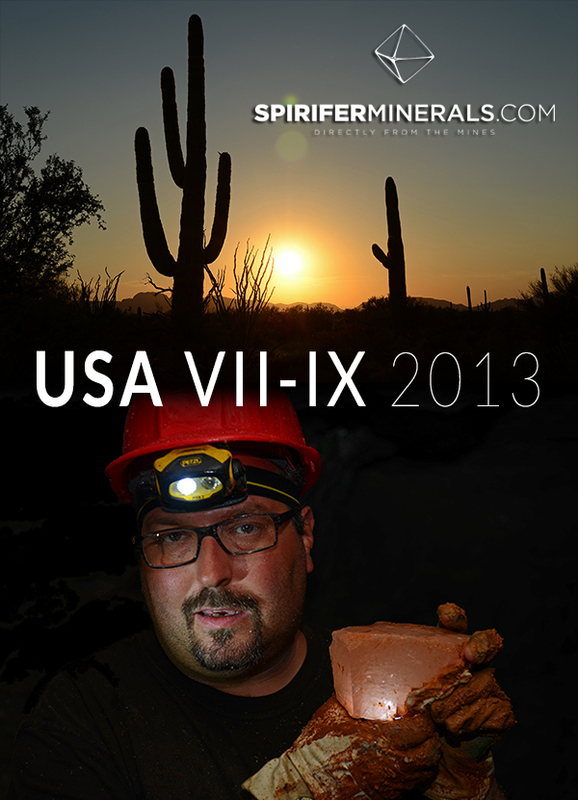 You can read more about Spann`s and their collection in the 5th issue of MINERALS newspaper. 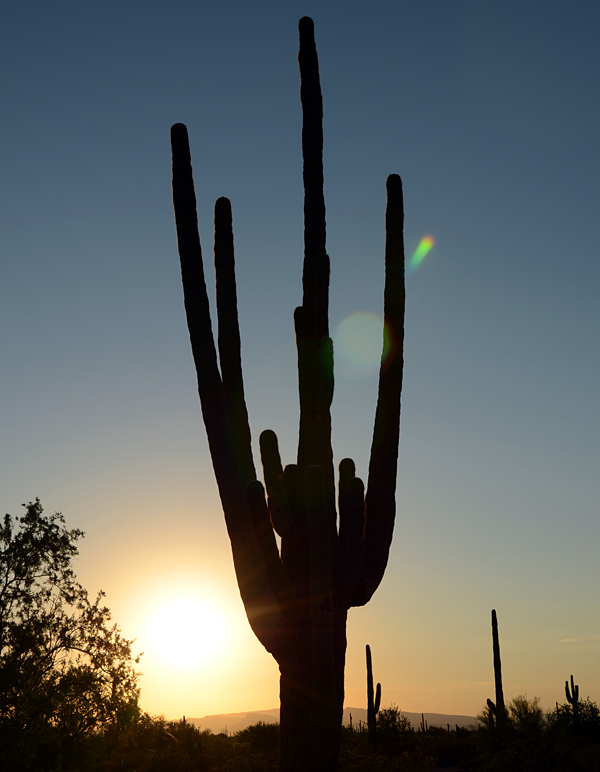 Directly from the Spann`s Soiree we drove to the airport and flew to Phoenix, where the same evening we met our friend, and MINERALS co-editor, Paul Cragan. Sad thing about this first days was that our camera broke and we were not able to take serious photos for the next 2 days. 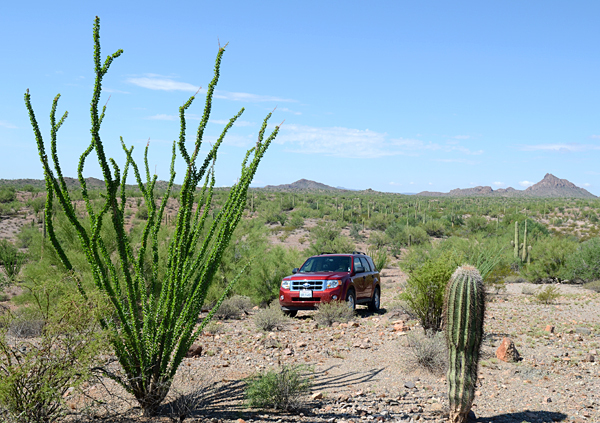 Next day we drove to Tucson where we met mineral dealers - Mark Kielbaso and Lisa Brower, then we spent some great time with famous Mexican minerals collectors Peter and Allison Megaw, and finally we visited Wendell and Carolyn Wilson. Wendell is the editor of Mineralogical Record and a walking encyclopedia. In his house there is an enormous library of old mineralogical books owned by MR. Some of these books are several hounders years old. Wendell is also an artist and has many mineral-related paintings in his house. He collects thumbnails and his very fine collection fits in a small vitrine. Here you can get some details about Wendell and his collection. 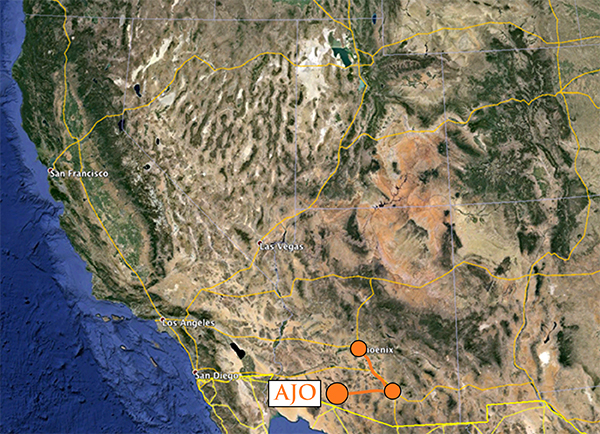 Next morning we started our journey through the South-Western USA. 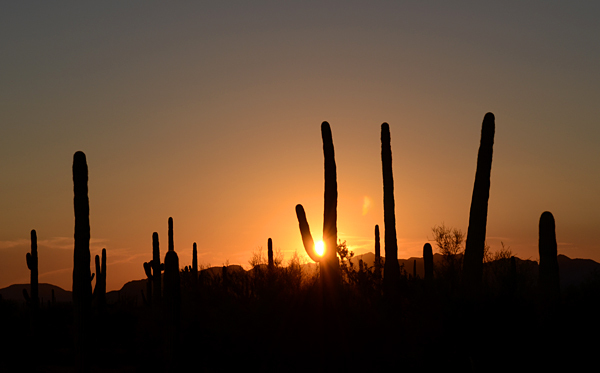 First, after getting our camera fixed, we drove through Sonora desert, along hills covered with Saguaro cacti, to visit Organ Pipe National Park. 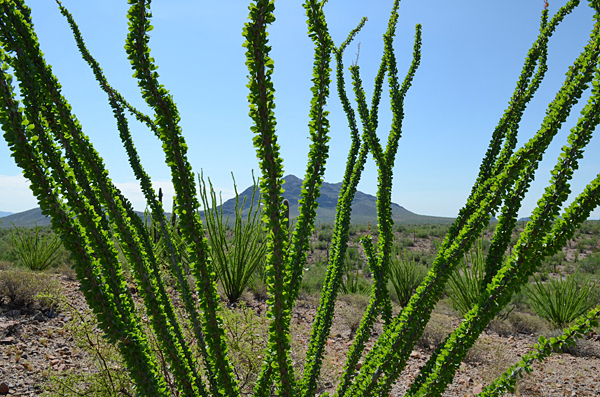 The parks protects Organ pipe cactus - a large cactus rarely found in the United States but common in Mexico. 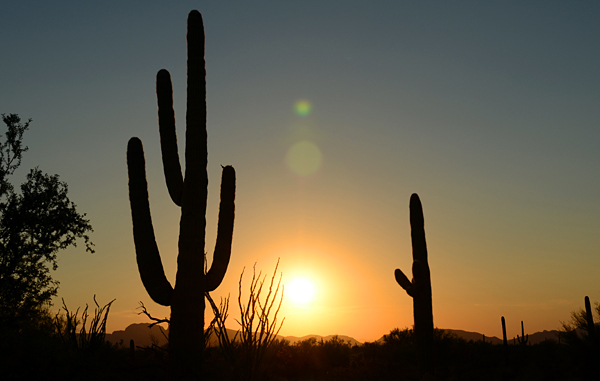 There are also thousands of Saguaros, that immediately bring to mind the films about the Wild West. 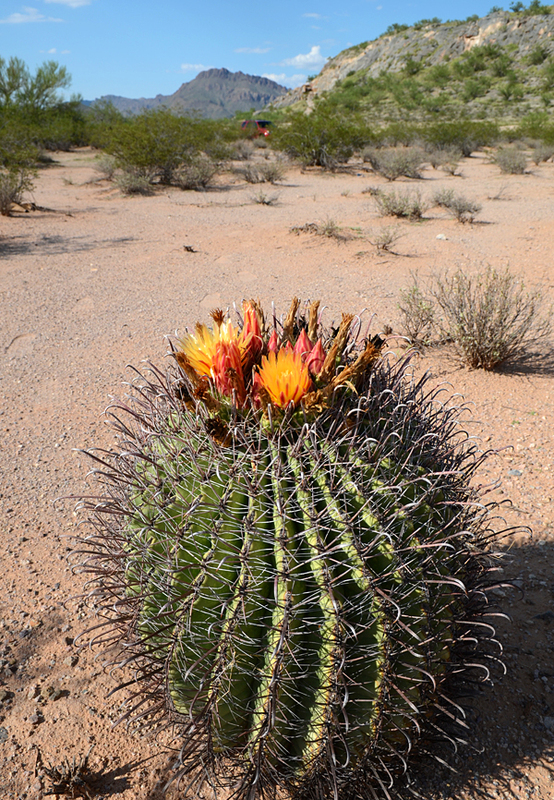 These cacti grow only 2-3 cm/year and reach 5-15 m.
Next day we visited desert, Spanish style mining town Ajo, that is famous for minerals. Town itself is ten times smaller than the open pit and even smaller compared to the dumps and tailings that surround it. 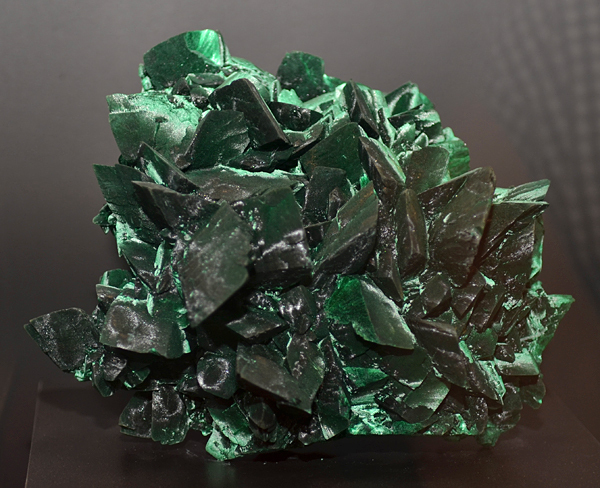 There were numerous azurite and malachite produced in Ajo when the quarry worked. Sharp malachite pseudomorphs after azurite were especially well known from there. 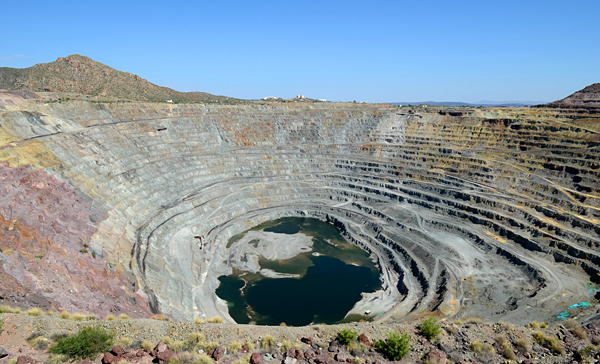 Today huge, 1,8 x1,4 km open pit is just a tourist attraction. Old quarry walls are covered by secondary Cu and Fe minerals looking like impressionists` paintings. Small ponds on some of the levels are surrealistic turquoise and blue-green colors. We drove around the pit trying to find a way to check some of the dumps. We didn`t find a lot but it looks like if one had a permission they could still collect a lot there. 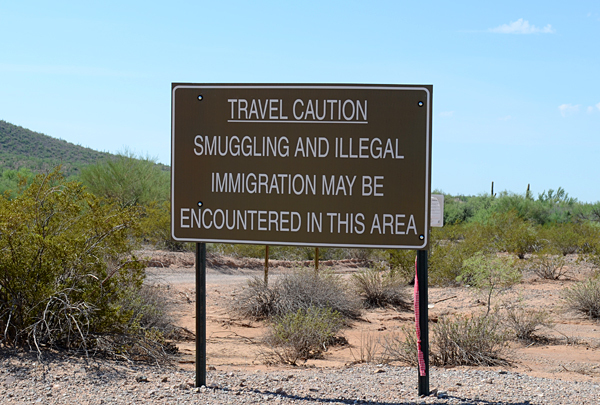 Later that day, we drove through southern part of Mojave desert, passing dunes and other spectacular landscapes. Eventually we arrived to San Diego on the Pacific coast. Surfing turned out to be a great fun, even though there were a few bumps and bruises. After that we visited The SeaWorld, it is something between an amusement park and zoo, surely a great place for kids. We are big fans of the marine animals so we liked it too. The biggest attraction of the park are killer whales. They perform a show with a lot of somersaults and other tricks. You can also play with the dolphins, feed them and observe their tricks, which they seem to be very proud of. There are also a few roller-coasters and other funfair attractions but we did not focused on them. In the evening we visited our friend John Attard and his wife Kathy. 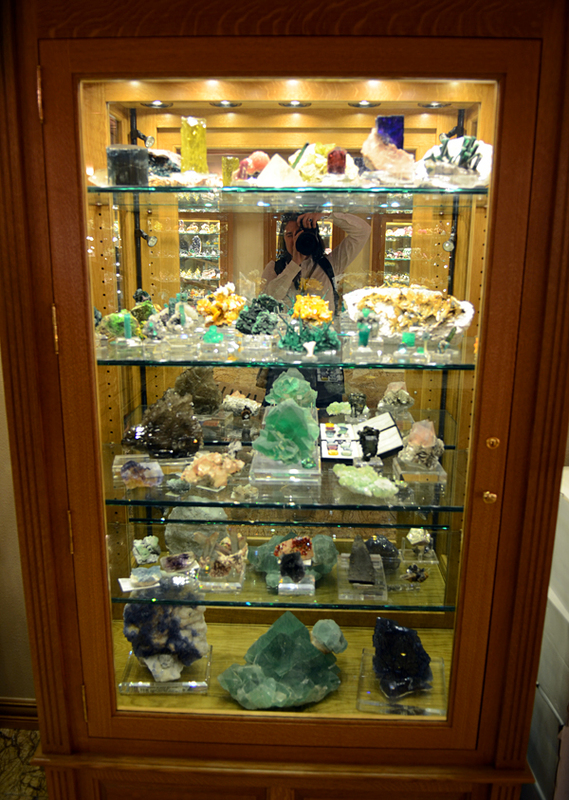 John is a collector and owner of Attard`s Minerals, he showed us his interesting collection. He focuses especially on tungsten minerals, especially worth noticing were ferberites and hubnerites from different localities. Later we went all together to the Gaslamp Quarter – the historical heart of San Diego, where we had a very nice time. I have to say that generally the historical sites of the USA were mostly the same age as our apartment block in Warsaw :-) and the “old towns” were a bit different than we expected but even though we liked them very much for their friendly atmosphere. The next day we visited the Coronado Island from where you can see a nice panorama of San Diego`s center. Later we visited the zoo - a must-see attraction of the city. It houses almost 4000 animals. We liked especially the section with apes and a few giant aviaries where you felt as though you were walking in a real tropical forest surrounded by different birds. We also felt sorry for the polar bear – because it was around 40C. It is quite an unusual temperature for San Diego which is known as a place with very stable temperatures throughout the year – 15-20C in the winter and 20-25C in the summer and an average temperature of 18C. We dream of such climate in Poland ... On the way from San Diego we visited La Jolla – well known resort with cliffs, beaches and a lot of surfers. The interesting thing we saw there were numerous seal – some of them swimming with people and sitting on the beach 5 meters from the sunbathing people. From Fallbrook we drove to Himalaya mine. First we visited the “tourmaline dig’” where visitors can look for gems in the dumps paying a small fee (see more about it here) Himalaya mine is one of the most famous and most productive tourmaline mines in the world, in its long history it produced many superb specimens and tons of gem and carving material. Nowadays there are only minor workings, but interesting pockets are still being found. Mine is operating in one pegmatite vein with thickness from 50 to 150 cm. Thanks to Chris Rose (the owner) and our guides: Jessica Scheng, Scott Ritchie and Erik Cordova we were allowed to make a super exciting visit in the mine. Recent workings in Himalaya are occasional and carried out only in selected zones in the parts where pegmatite veins had been not exploited yet. The vein features quite a big depth, so all workings are going down following it, it takes a longer while to descend steep tunnels. In the vast majority vein is exploited but in some places it is very well visible in the security pillars and walls. There are many traces of the old mining activity. We were very happy to see that famous pegmatite. Zone which is now investigated by Scott and Erik is quite rich in the lithium concentrations manifesting in minerals such as elbaite and lepidolite. This zones are well visible because they are abundant in pink color minerals – unlike the black and white colors of the rest of the pegmatite. 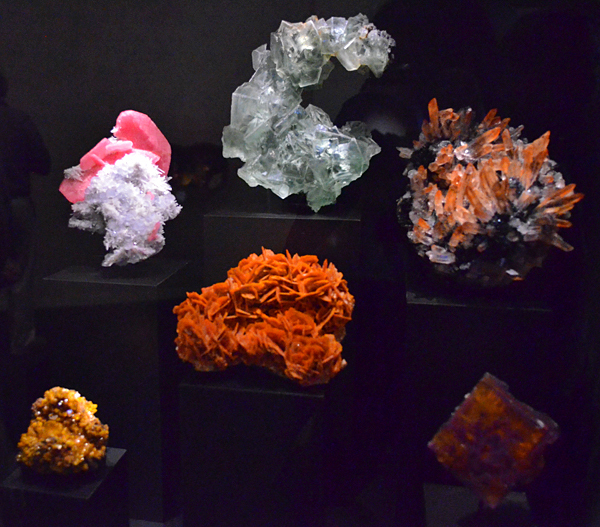 After we left the mine we saw some recently mined specimens and some of them were gem and colorful. The next day was also very interesting. We went to see the Oceanview mine. Here you can also dig for gems in the dumps (read more about the fee dig here). We had a privilege to go down. The mine itself is well organized and modern, with mechanic equipment, ventilation etc. It is also following the vein with big deep so the workings go down quite steeply. Going to the face, we saw some enormous weathered spodumene crystals up to 1 m big. It turned up that we were very lucky because a new pocket had just been opened in mine face. As majority of the pockets it looked like brecciated rock, with spaces between crystals filled with clay, we stared working immediately and at first the quartz crystals showed up, we collected pocket content to the buckets to check it later on the surface, using simple tools and water we filled more and more buckets, suddenly we saw differently looking crystal, when we looked closer it turned out to be a big gemmy morganite. We removed it very carefully, unfortunately it was not attached to any quartz or feldspar. After a quick cleaning we found out that it was probably the biggest morganite known from the mine. Later after more cleaning it proved to be with good geminess but quite weathered and etched on the surface. Anyway, this find was really exciting, and we hoped to find more, so we dug much faster :). We removed several bigger quartz crystals, up to 20 cm, but found only small broken chunks of morganite, no good crystals. When we finished cleaning the pocket, we moved to the surface where we washed the whole content of the buckets. Unfortunately, we found there only low quality quartzes and some gem but not collectors quality morganites. So finally in the whole pocket there was only one complete crystal. 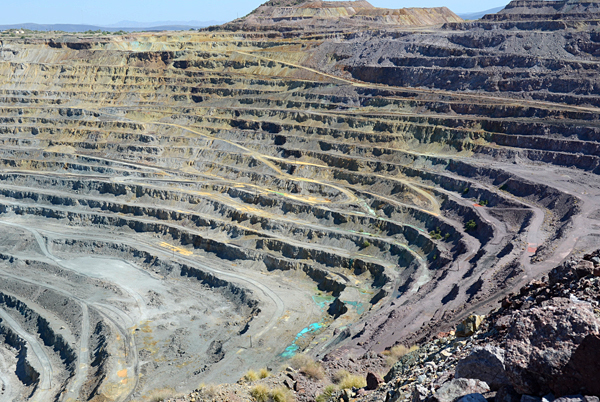 After this thrilling experience we drove to see another mine in the area. 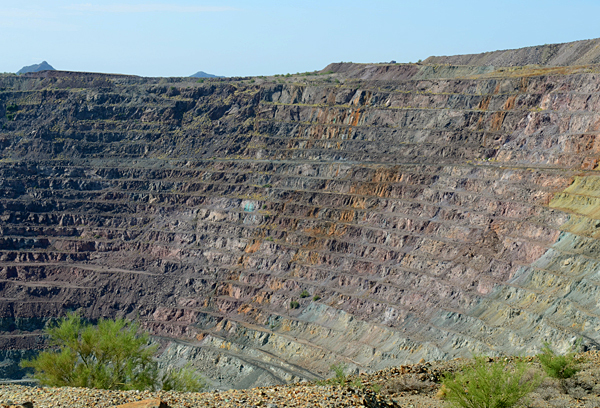 Tourmaline King mine is located next to the famous Tourmaline Queen mine. 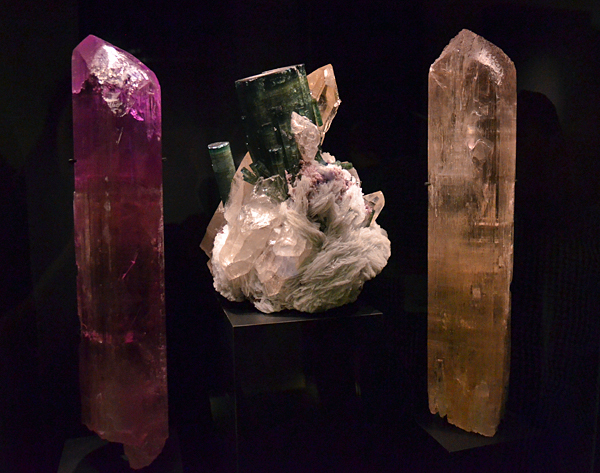 In the beginning of 20th century it produced bubble gum pink tourmaline crystals – including outstanding steam boat specimen. For the last decades mine remained abandoned but recently Scott and Erik started the exploration. Pegmatite is very well exposed, the vein is very thick compared to the other veins in the area (about 2 m) and we hope that they will start serious works soon and find something exceptional. 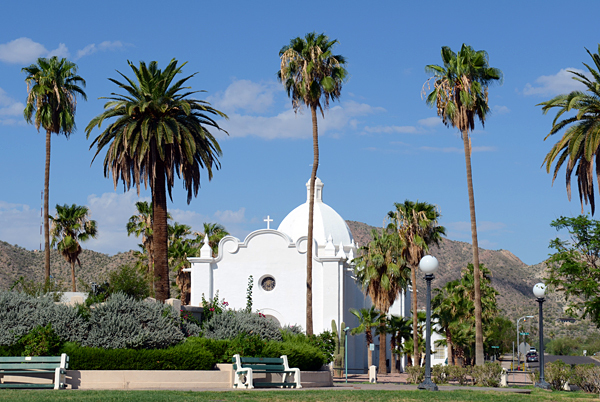 From Palm Springs we moved to Los Angeles where we met a famous collector, writer and Mindat supporter – Rock Currier. 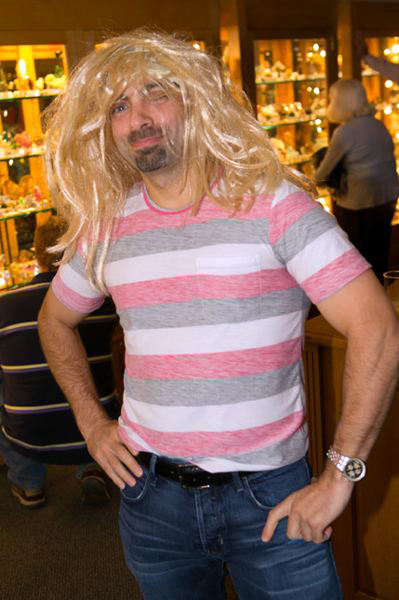 Rock has a huge collection of world class specimens. We were lucky to see it. 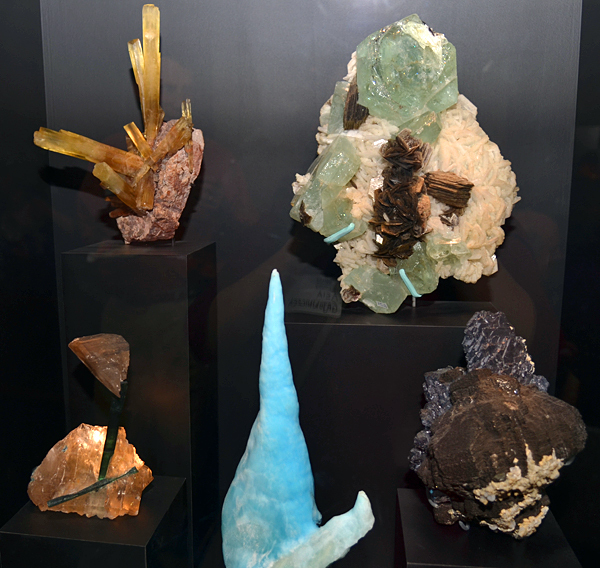 Rock has been building his collection for many years, he acquired many of his specimens during his travels around the world, so he has especially good specimens from where he travelled often - South America, USA, Tsumeb, and India. It is also very well organized and contains specimens of all sizes – starting from thumbnail sub-collection to half meter big specimens. 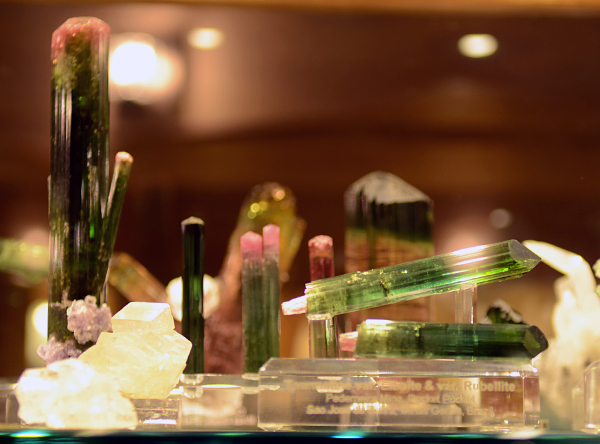 Rock used to sell borates from California for many years and he still has an extended collection of these unusual minerals. 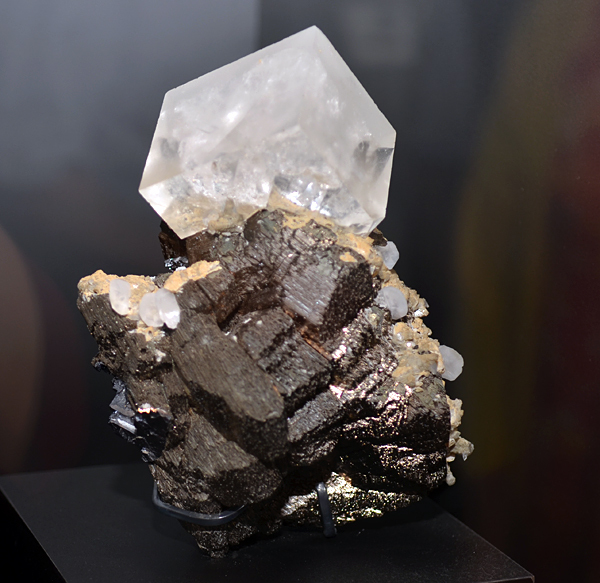 Rock was also the first person bringing these minerals from India to the western market, and he keeps a big sub-collection of Indian zeolites. The next day we met other friends – John `Krupnik` Veevaert and Ronna. 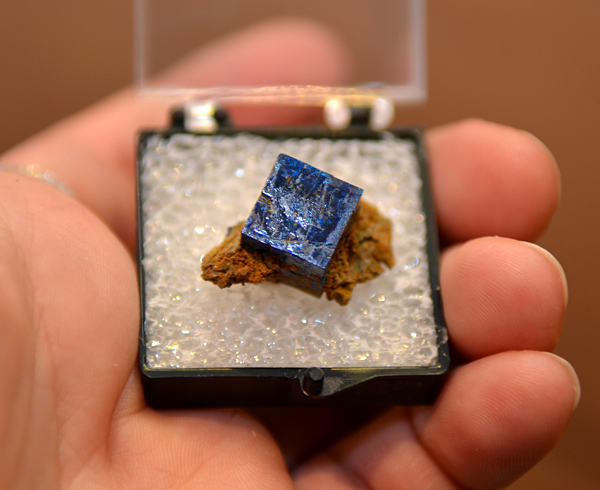 John is a benitoite collector and owner of Trinity Minerals. We visited together Los Angeles Natural History Museum. 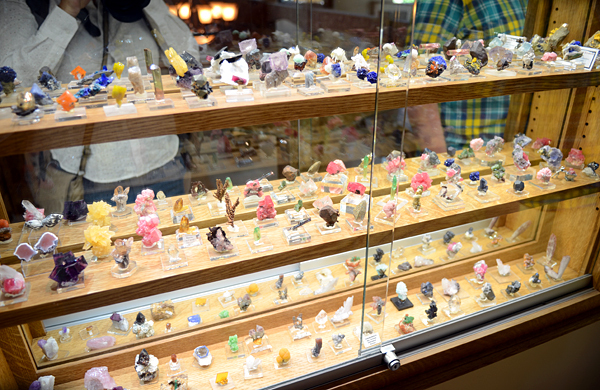 There is well known mineral exhibition which was of course our main goal. 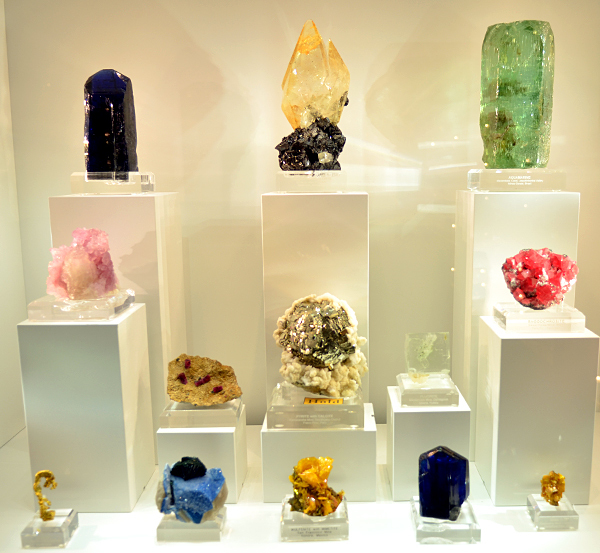 The museum has a big California minerals collection (including one of the world best benitiote specimens) and very fine world collection as well as gemstones collection with numerous diamonds, sapphires and rare species. 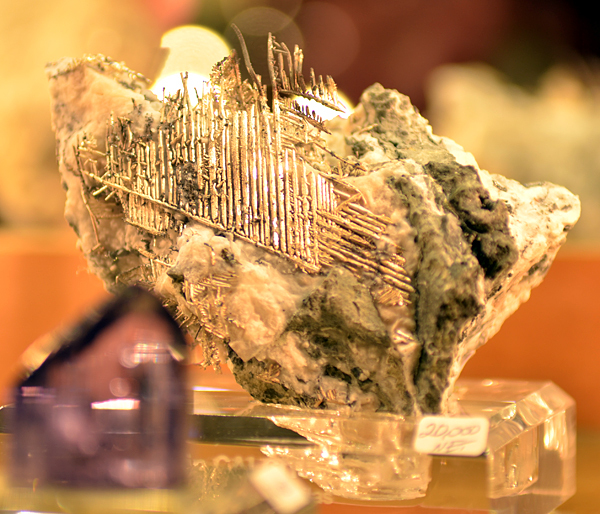 One of the highlight of the exhibition are gold specimens and nuggets with the well known gold wire (it is the rarest form of gold crystals). After that we continued with sightseeing in the Aquarium of the Pacific in Long Beach. We really loved it, unfortunately we had only 40 minutes before it closed so we had to run to see everything, but even though it was fascinating. The aquarium features over 11000 animals representing over 500 different species in really huge aquariums that give you the impression as though you were diving in the ocean. In the evening we met Mark Mauthner again (he was taking photos in LA) and we went together to see Hollywood. It turned out that Mark was right and Hollywood was not as impressive as one may think. We spent a night just by the beach so Asia could go surfing in the morning. As soon as she finished, we set off to the Death Valley. Just before we arrived, there was a heavy rain and some roads were closed because of flood. This was not the first thing we expected in the place with 1,5 inches (38 mm) of average rainfall per year. We were lucky and we get to the Dante`s viewpoint just in time for a beautiful sunset over the Death Valley. We spent the night in Fournance Creek. When we went out of the room at 11 p.m. we felt like someone was using a hair dryer pointed into our faces. It was over 40C with a strong hot wind even though it was the middle of the night. Very interesting experience. The next day we drove through the valley visiting the main touristic spots - including the point of lowest elevation in North America (-86m/-828 ft), Devil`s Golf Course (large salt pan) and colorful Zabriskie point. We also visited small museum in Fournance Creek with old mining equipment. The most interesting were the wagons of twenty mule teams. These were 18 mules and 2 horses attached to large wagons transporting borax mined in the Death Valley to Mojave. 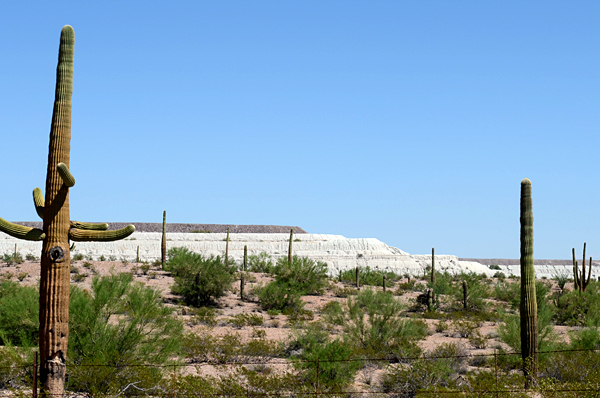 It worked between 1883 and 1889 and transported 24 t of borax on a road of 165 miles, what took 10 days. It was later replaced by more mechanized means of transport. The highest temperature we experienced was 127F (53C) while the highest ever reported (and at the same time highest temperature on Earth) was 134F (57C). From the Death Valley we drove directly to the Sequoia National Park – quite a drastic change of environment in one day! We were very impressed by the size of the trees! It is not possible to show this size in the photos even with a scale – one has to feel it on their own. Of course we stopped by General Sherman – by volume the largest known tree living on Earth. It is 83,8 m (275 ft) high with a diameter of 7,7 m (25 ft) and estimated bole volume of 1487 m2. It is about 2000 years old. Our next destination was San Francisco. 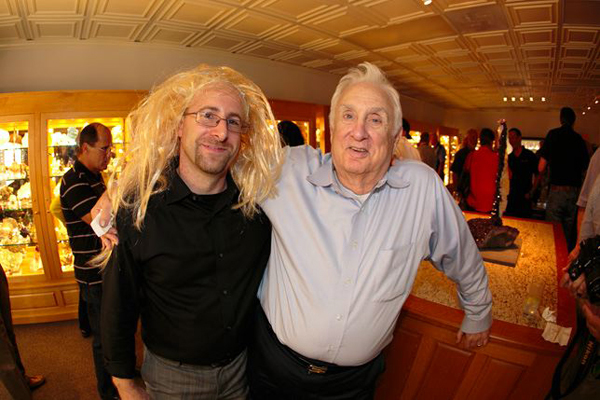 We met there our friends – Jesse Fisher and Joan Kureczka. 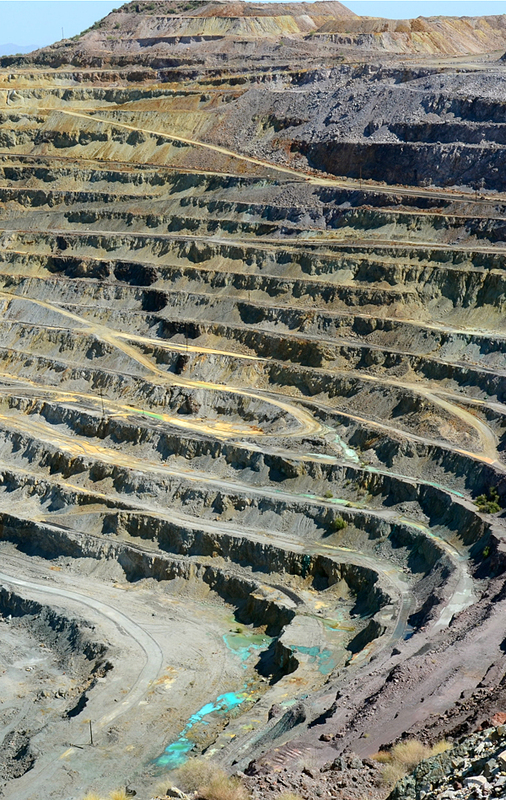 They are collectors and co-owners of the Rogerley mine. They have an extremely nice house in San Francisco with a beautiful view to the downtown. We spent the night there and Joan and Jesse showed us their collection and their city. They specialize in calcites, tourmalines, minerals of California pegmatites, but also feldspars (Jesse`s scientific interest and PhD subject) and fluorites (with a special interest in England and Rogerley mine). San Francisco is more “European” in style and architecture than other cities in the USA that we have seen (and certainly much more than Dallas :-) There are a lot of people walking and going by trams, a lot of climatic pubs and restaurants, the city really has a great atmosphere. We really liked it – especially the view to the Golden Gate Bridge and the whole city from the neighboring hills. 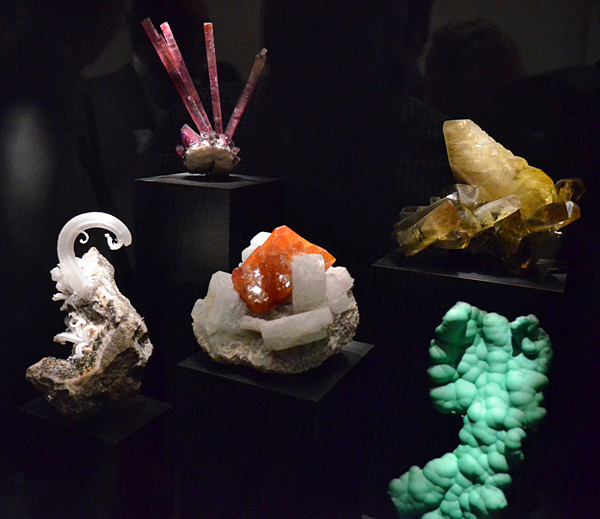 When our time in San Francisco came to an end, we had to start moving toward Denver to join the mineral show there. It was a looong drive. At the beginning our GPS showed 2000 km (1242 miles). We took US50 known as the Loneliest Road in America – and this name is not exaggerated, it is really lonely and one meet more deers than cars there. It is also very beautiful. On the way we stopped for the while in a small town full of casinos in Nevada, actually it looked like there were nothing else apart from casinos. We arrived in Denver after 2 days. It was our first time at the this show. Denver show is the second biggest show in the USA. 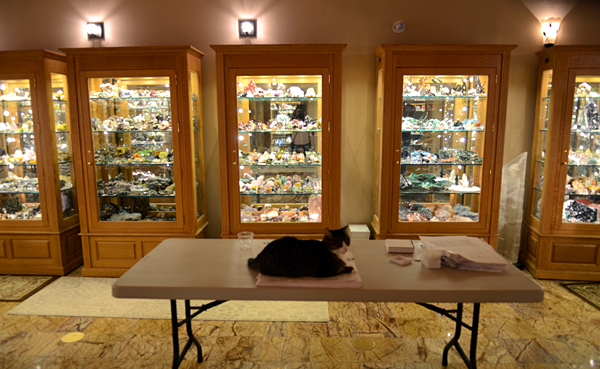 We had a selling room in Ramada Plaza Hotel, and later shared a booth with our friend Steve Perry (who specializes in rare gemstones and benitoites) at the main show. Denver show is a little bit like Tucson but shorter and much has less venues. 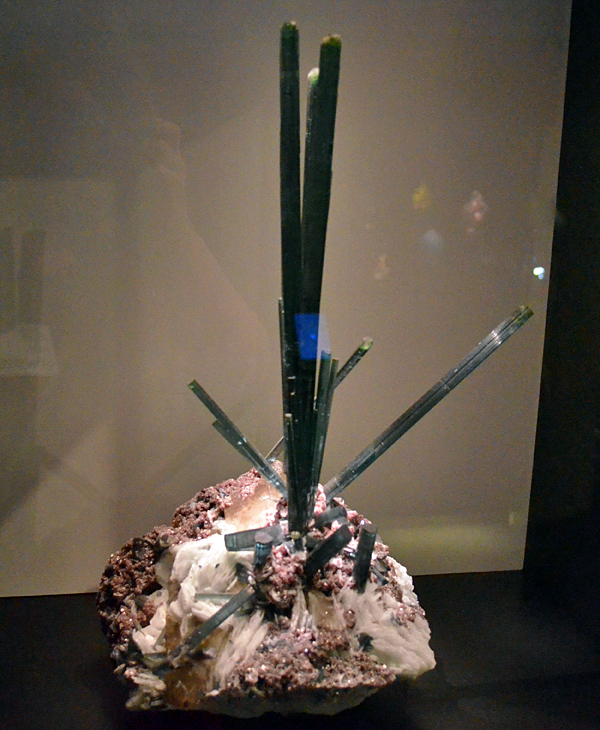 This time the topic of exhibition on the main show were tourmalines. Private collectors and as well as many institutions from all over the world brought some really good specimens. 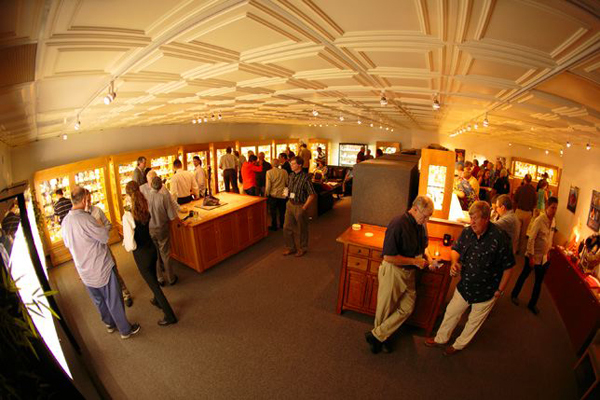 The most impressive was the showcase with tourmalines from Gail and Jim Spann`s collection containing many very fine specimens. Another outstanding showcase was filled by Martin Zinn, it displayed specimens from Himalaya mine including some of the most famous ones. Another especially interesting showcase was the one with topazes from a new find in Colorado that is known as "Tribute pocket" - big, champagne-colored, highly etched crystals from that find are really exceptional and very different from all topaz specimens known so far from the Northern America. 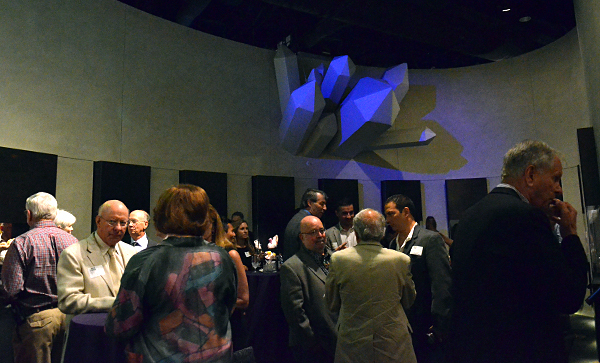 Of course the show is also full of social events – we spent one great evening in Colorado School of Mines. 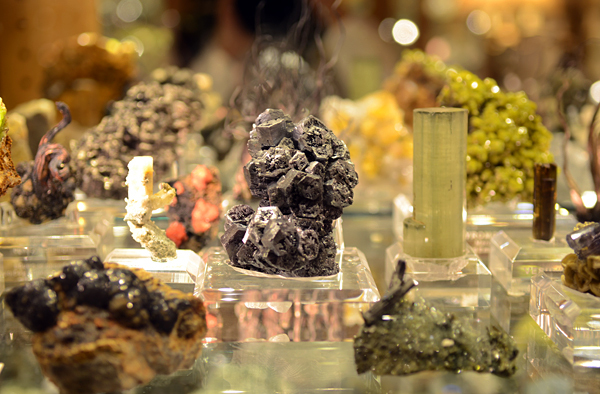 It is home to a wonderful Colorado collection including famous rhodochrosites, aquas, golds and amazonites. 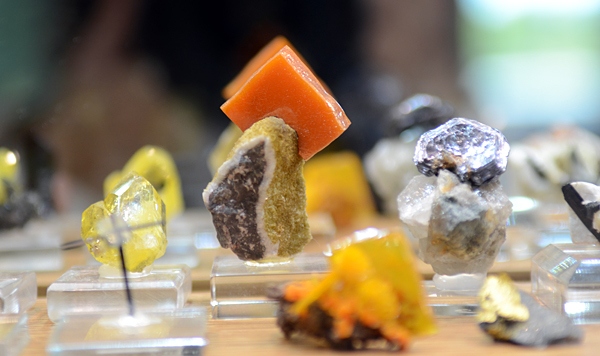 There were also a few small interesting temporary showcases – one of them showed pyrites and another fluorites from Colorado, and many top quality specimens from all over the world. 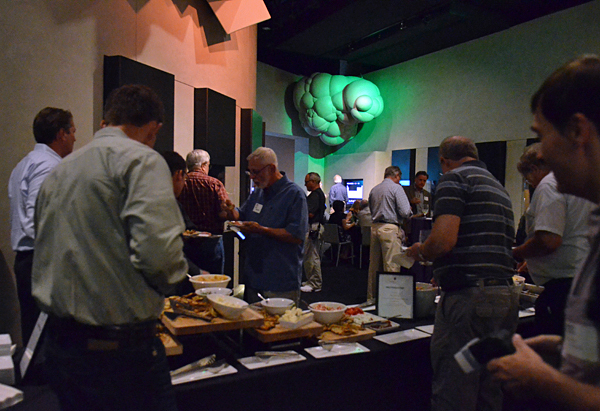 We spent another great evening attending probably the most spectacular event of the Denver show - the showing and sale of the famous Ross Lillie`s collection of the Illinois fluorites. 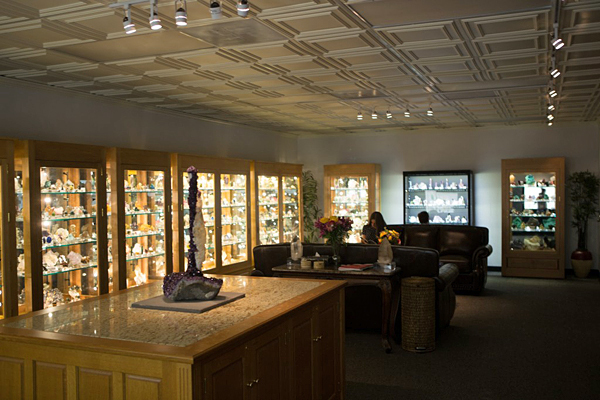 It was organized by Fine Minerals International who bought the whole collection from its previous owner and it was it took place in a hotel in Denver`s downtown. It was the first time this famous collection was showed to the public. 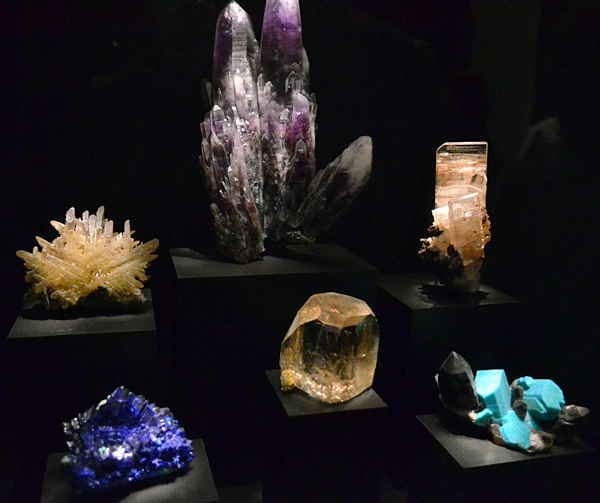 There were 800 specimens displayed in about 10 modern showcases with very good lighting. 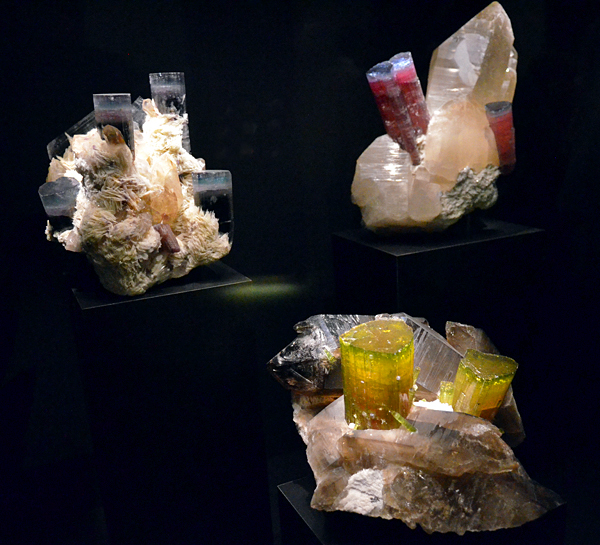 They represented all types of fluorites from Illinois, including etched ones, phantoms, inclusions, all possible colors and forms. We were amazed not only by specimens but also by the quality of display. 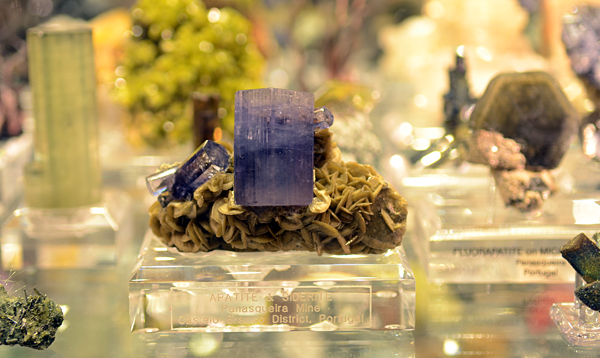 It must have been a big night for all fluorite collectors :) This event was also a great social meeting, for sure it set up a new standard of selling and showing collections like this one. After the show finished we spent some time around Denver, we visited the main headquarter of Collector`s Edge that is located in Golden. 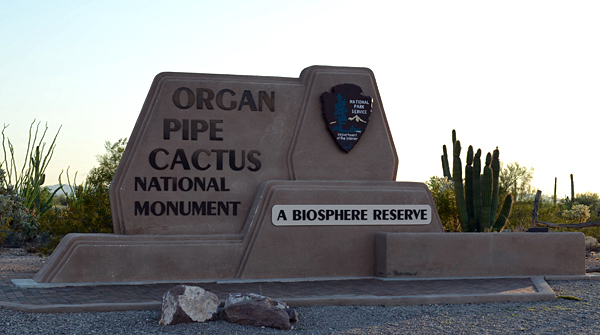 There are thousands of specimens, huge lab facilities and much more. Especially for the show Brian Lee, (owner), put his private collection on display, he collects only Colorado specimen. Thanks to the fact that his companies operated several mining projects in Colorado, his collection is full of incredible and famous specimens. 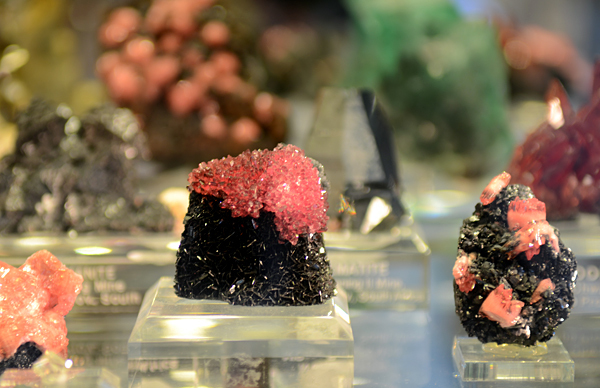 Of course the best known project of Collector`s Edge was Home Sweet mine, Brian kept hounders of specimens from that project as documenting very pocket and habit, he has also a few dozens of top quality breathtaking rhodohrosites in all combinations. We spent the last few days before our flight so we decided to visit Colorado Springs. The area of the city is really beautiful. We went for a walk in the Garden of the Gods – a public park with outstanding rock formations and later we drove up to 4302 m (14115 ft) high Pikes Peak. Landscapes were beautiful but on the very top we felt a bit dizzy so we did not spend there too long time. We do not recommend the trip to people with acrophobia. 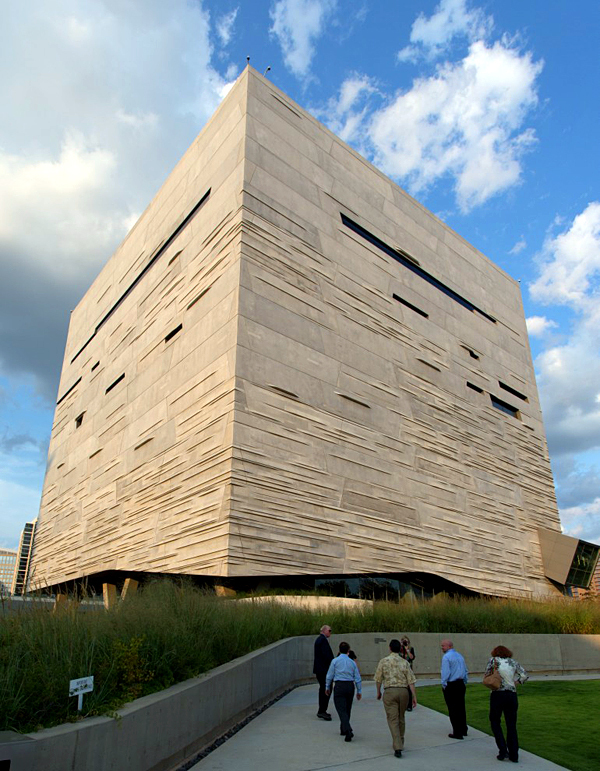 The last attraction we saw on this trip was Denver Museum of Nature and Science. 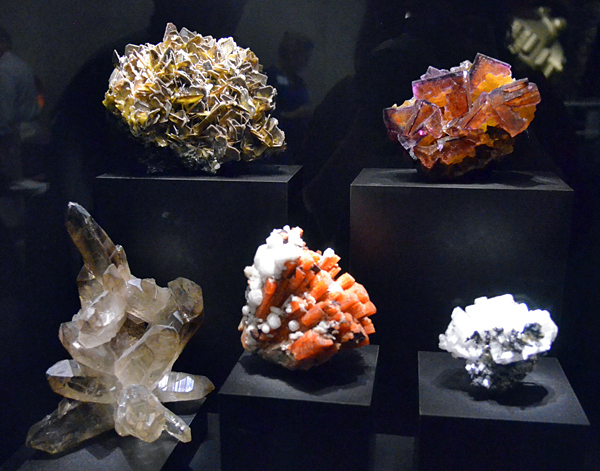 It is one of the biggest natural history museums in the USA, it has a big collection of dinosaurs` skeletons and other fossils and many other great exhibitions – including an interactive medical one that we liked, but of course the most interesting for us was the mineral collection. It is famous for Colorado specimens – representing all classic localities from those extremely renowned to those less popular. One of important parts are great gold specimens, but probably the most impressive are the reconstructions of the pockets. 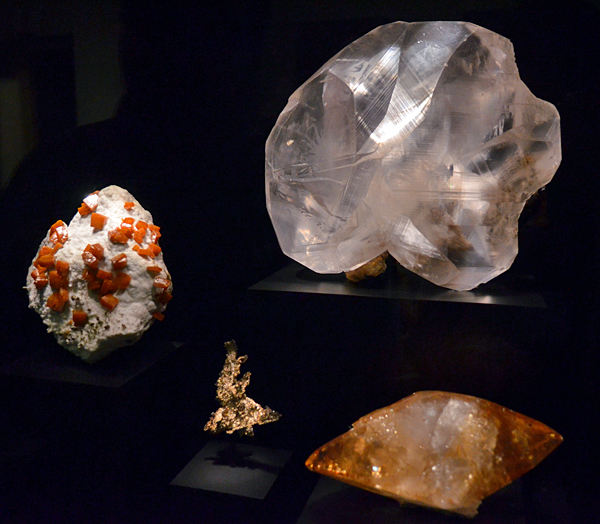 Starting from the room-sized calcite pocket from Mexico, through giant gypsum pockets, to the ones from Colorado. One of them was an interesting diorama with an amazonite pocket in the front and view to the Rocky Mts in the back, that looked like you were actually somewhere in the field. Second “Colorado special” was an enormous (best known from Northern America) aquamarine pocket from Mt. Antero. It is about 1 m and it is filled with 10 cm gem crystals. However the very best are the specimens from Sweet Home mine. Beside of several high quality specimens you can see there world famous 14 cm crystal of rhodochrosite on matrix known as `Alma King`. You really have to see that to believe it! We stared a long time at this piece and as we finally went further we were even more impressed by the reconstruction of the Home Sweet mine. 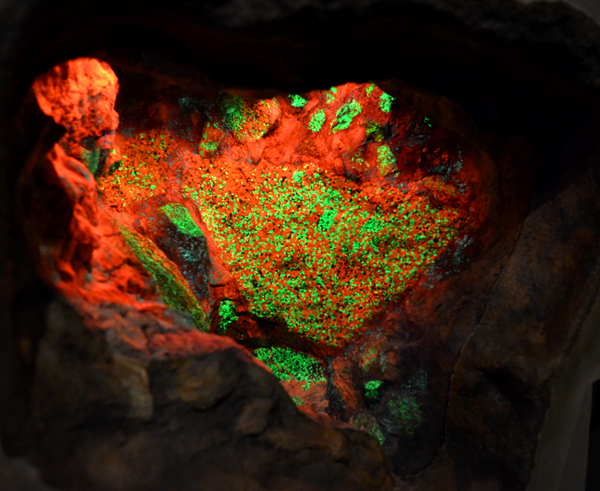 The visitors can “go inside the mine workings” and follow the vein that looks very realistic. Finally there is an original small pocket with nice rhodo crystals; but this is nothing compared to the last surprise – almost complete Coors Pocket reconstructed in the museum! 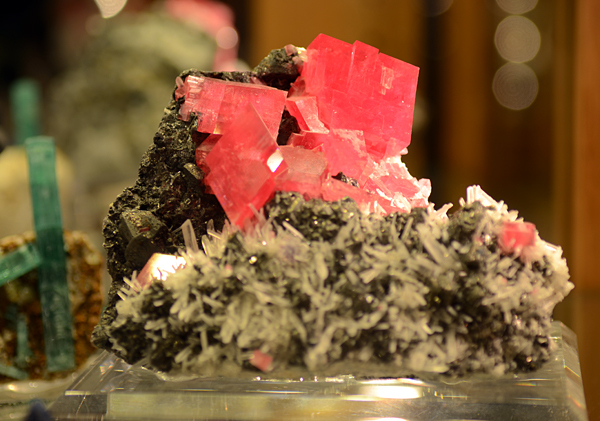 Hundreds of superb rhodochrosite crystals. It took Collector`s Edge 20 months of work for 3 people to reconstruct this pocket! There is over 3000 pieces put together! 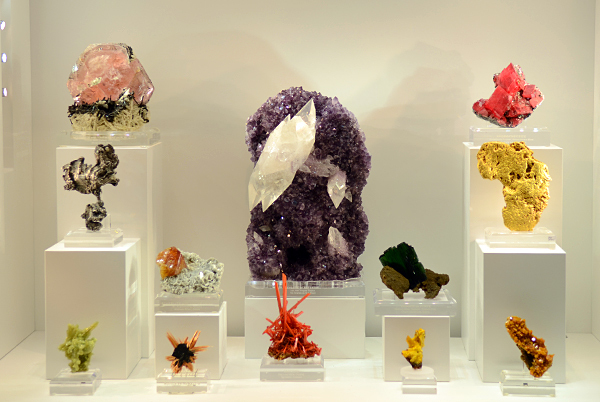 it is a great example of preserving mineralogical treasure for the next generations and wide public. This was an incredible finish of our trip to the USA. We loved it all and we will be back soon! We would like to thank all our friends who we visited on the way and spent some great time with. 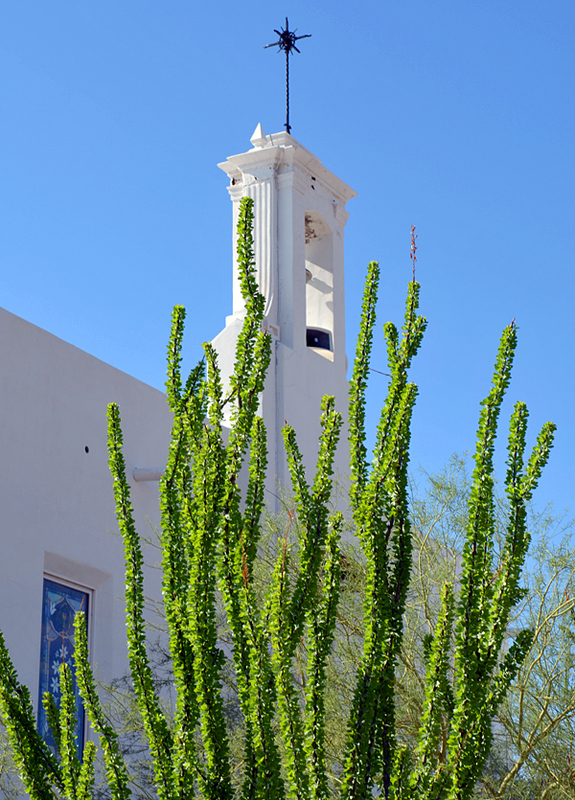 See you in Tucson! Our first flight - Warsaw - Frankfurt - Dallas. Google Maps. 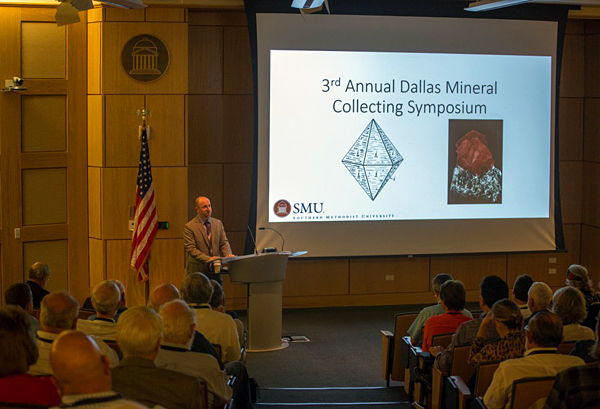 Our first goal was Dallas Mineral Collecting Symposium. 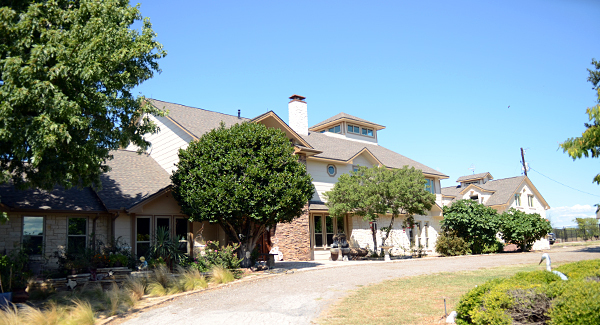 We were amazed by how few sidewalks there were in Dallas, you can move there only by car. J. Gajowniczek photo. Opening speach by Rob Lavinsky. J. Ralph photo. 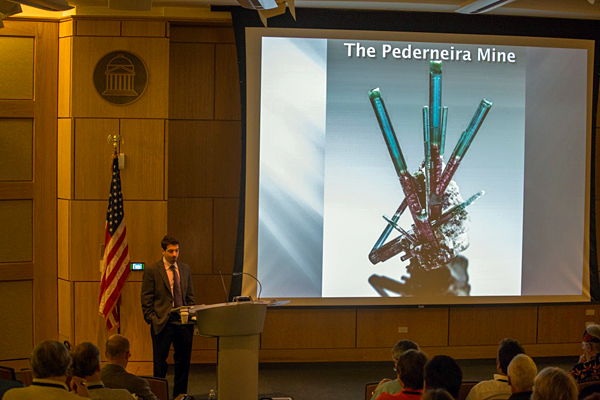 Presentation by Daniel Trinchillo about the Pederneira mine. J. Ralph photo. 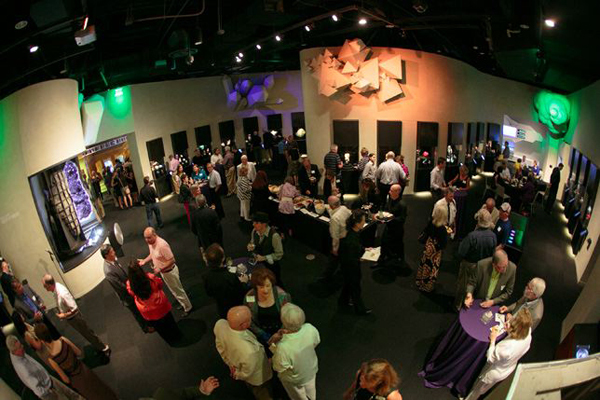 In the evening there was a party in the Perot Museum of Nature and Science. J. ralph photo. 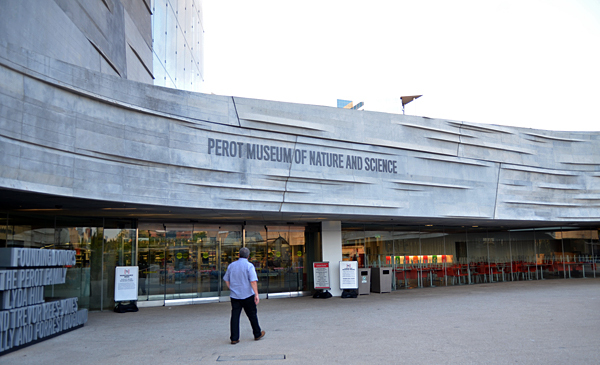 Entrance of the Perot Museum. J. Gajowniczek photo. 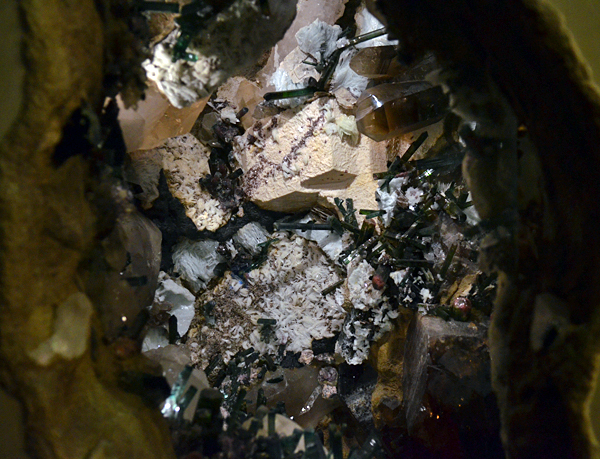 Entrance to the Minerals Hall through a `crystal` gate . J. Gajowniczek photo. Party in the Minerals Hall, note crystals models on the walls. J. Ralph photo. Party under quartz crystals. J. Gajowniczek photo. Party in the Minerals Hall. J. Gajowniczek photo. 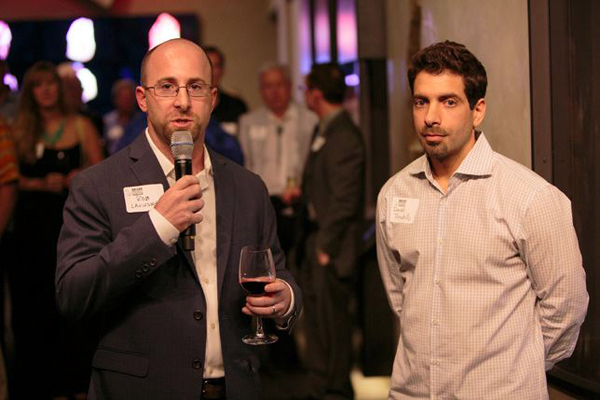 The previous (Daniel Trinchillo) and new (Mark Pospisil) curators showing new project of lighting. J. Gajowniczek photo. Rob and Daniel giving short presentation. J. Gajowniczek photo. Tom with Asia and Katya. J. Ralph photo. 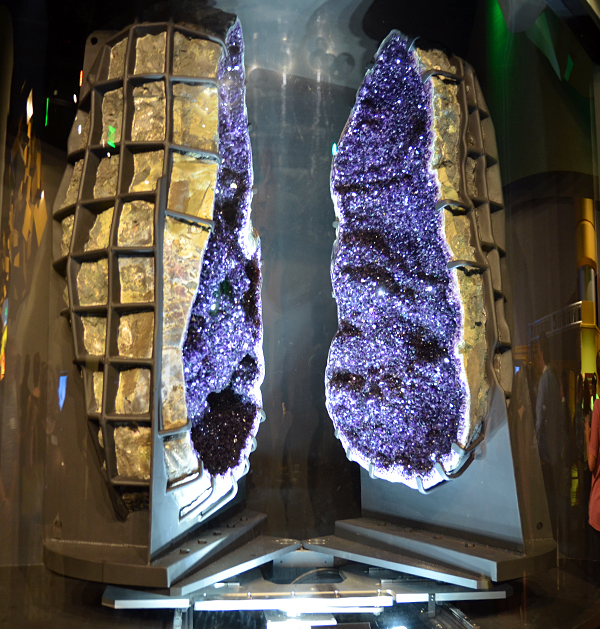 Huge amethyst geode that one can open and close on their own. J. Gajowniczek photo. 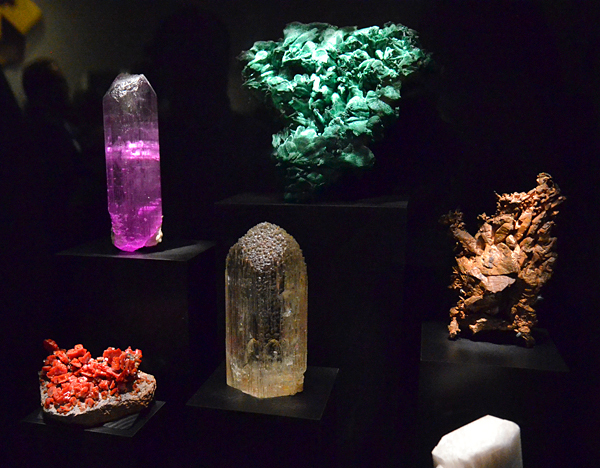 The minerals displayed at the exhibition are amazing. J. Gajowniczek photo. Exhibition in the Minerals Hall. Huge specimens, about 50 cm each. J. Gajowniczek photo. 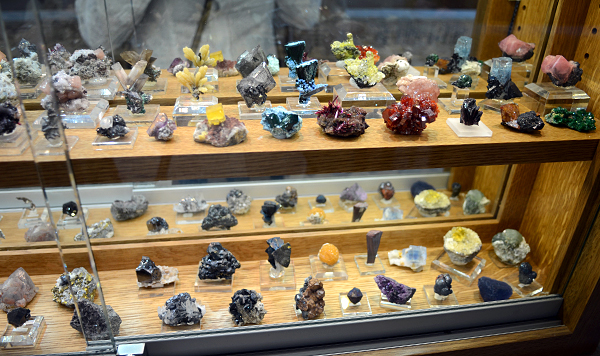 Exhibition in the Minerals Hall. Incredible tourmaline from Pederneira. J. Gajowniczek photo. Exhibition in the Mineral Hall. Reconstruction of the pocket in Pederneira. J. Gajowniczek photo. Exhibition in the Mineral Hall. "Pocket" with UV mninerals from Franklin. J. Gajowniczek photo. Exhibition in the Mineral Hall. Incredible serandit in the middle. J. Gajowniczek photo. Showcases are very colorful. J. Gajowniczek photo. Exhibition in the Mineral Hall. Note superb Pederneira specimen. J. Gajowniczek photo. Exhibition in the Mineral Hall. Giant beryls. J. Gajowniczek photo. Exhibition in the Mineral Hall. J. Gajowniczek photo. Exhibition in the Mineral Hall. Two superb cerussites from tsumeb. J. Gajowniczek photo. Exhibition in the Mineral Hall. 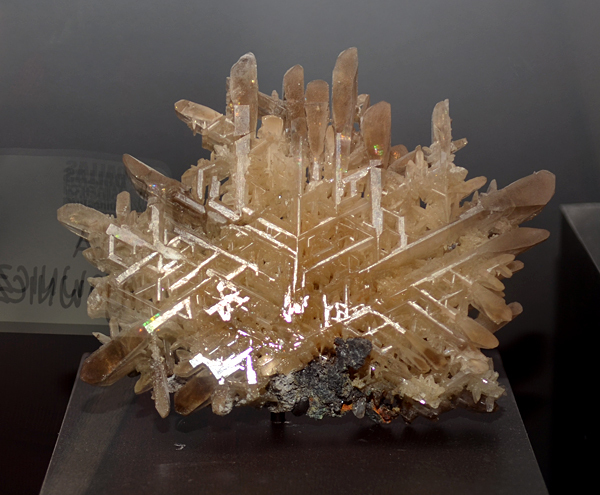 Beautiful snowflake cerussite from Tsumeb. J. Gajowniczek photo. 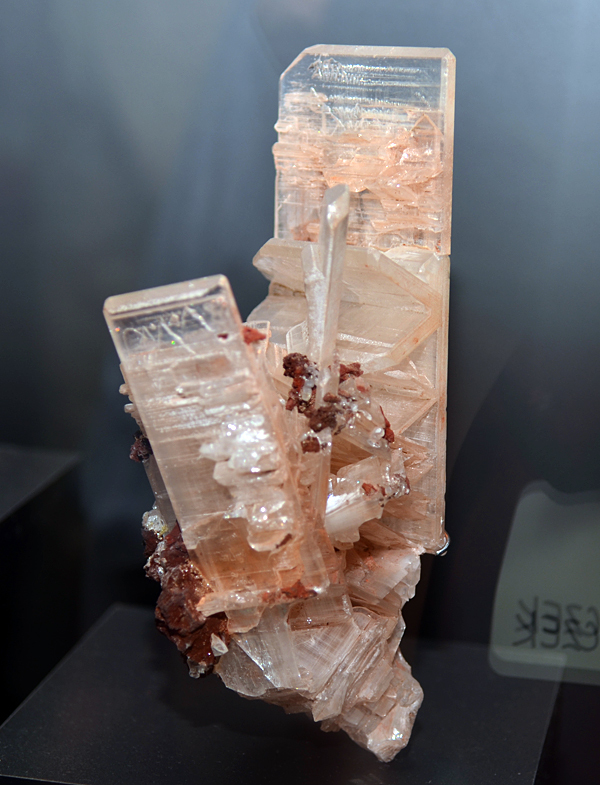 One of the best pieces in the museum - huge tabular cerussite from Tsumeb. J. Gajowniczek photo. 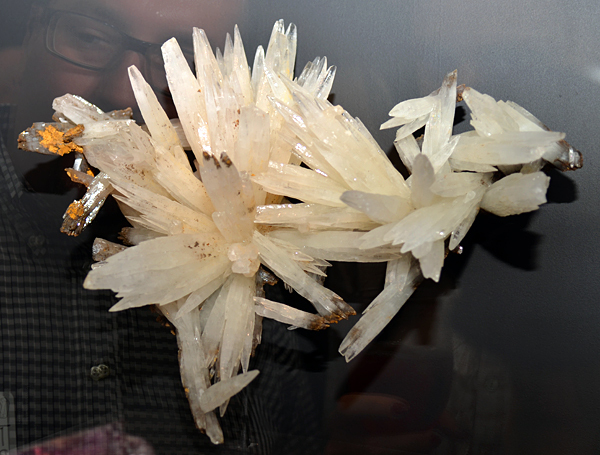 About 30 cm wide, unique aragonite from Podrecany, Slovakia. J. Gajowniczek photo. Fluorite on pyrothite, Dalnegorsk. J. Gajowniczek photo. 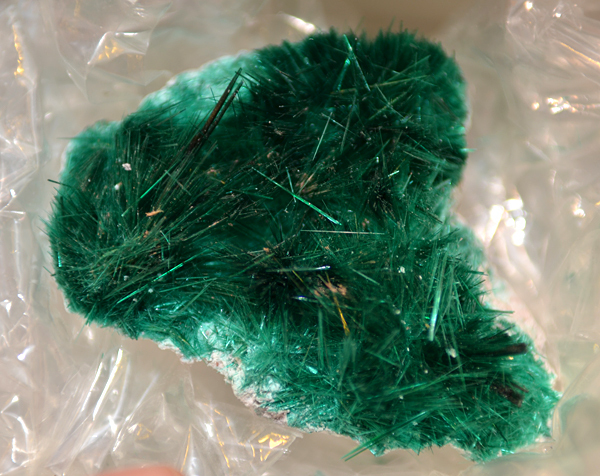 Malachite after azurite, Milpillas. J. Gajowniczek photo. Famous crocoite from Adelaida, 2010 pocket. J. Gajowniczek photo. Big rhodochrosite from Wutong mine, China. J. Gajowniczek photo. 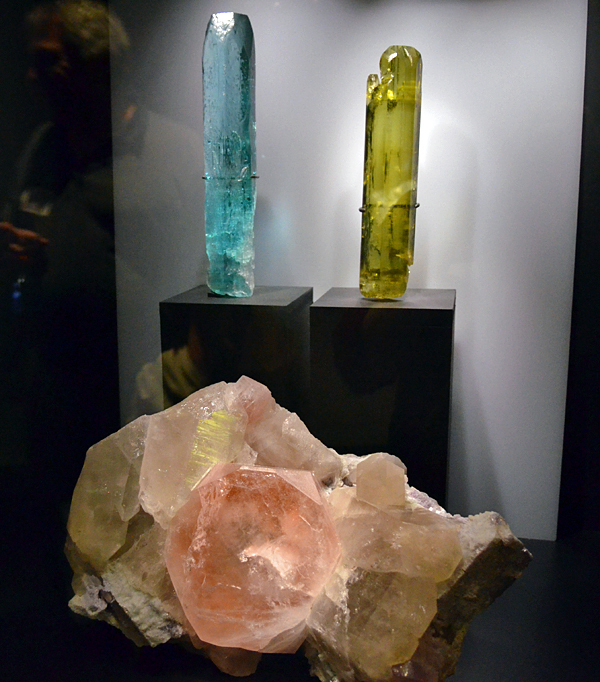 Famous Blue Cap and Six-Pack specimen from Tourmaline Queen mine, California, USA. J. Gajowniczek photo. 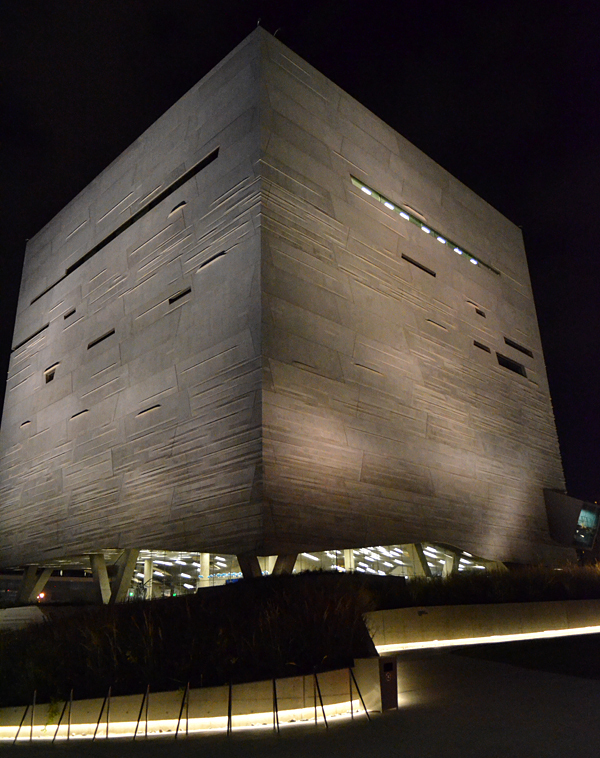 Perot Museum building by night. J. Gajowniczek photo. 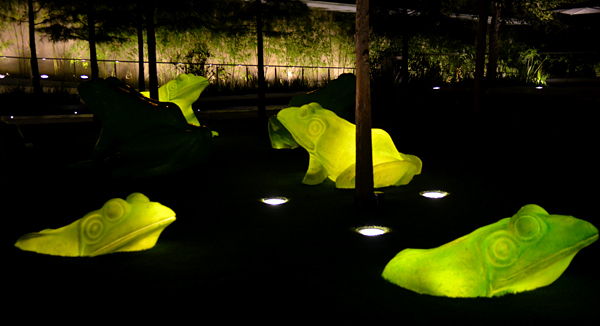 Frogs by night :-) J. Gajowniczek photo. 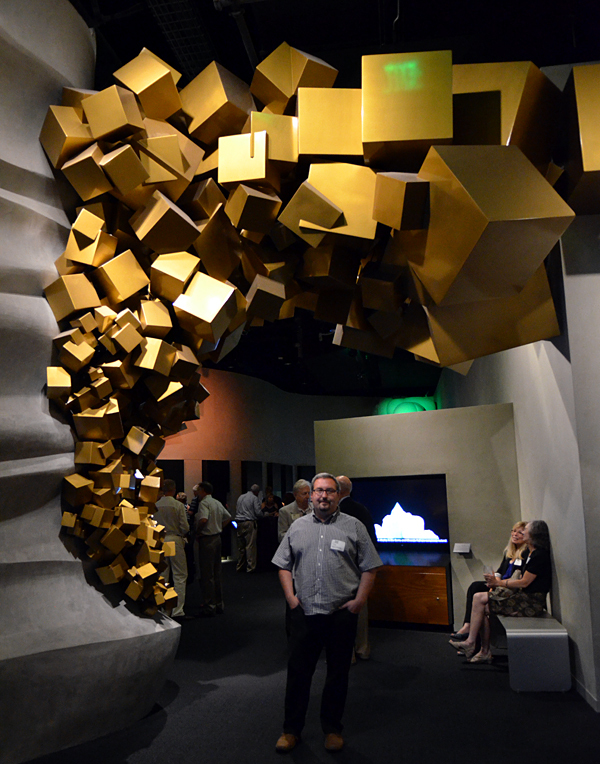 And another evening full of minerals - party in The Arkenstone gallery. J. Gajowniczek photo. Party in Rob`s gallery. J. Ralph photo. Party in Rob`s gallery. J. Gajowniczek photo. Daniel Trinchillo pretending to be Wayne Thompson :-) J. Ralph photo. Rob Lavinsky pretending to be Wayne Thompson with Gene Meieran. J. Gajowniczek photo. Spectacular specimens for sale. J. Gajowniczek photo. 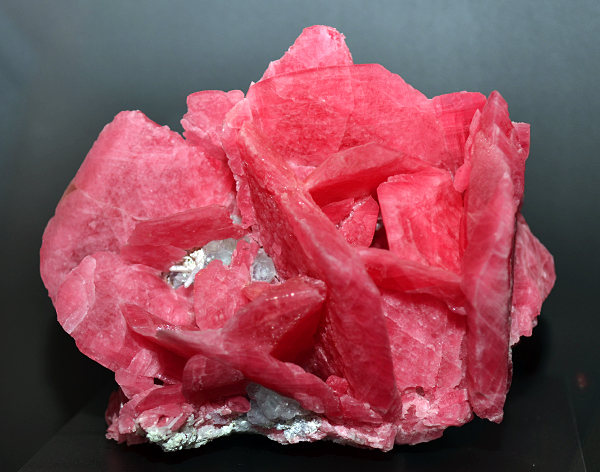 Great rhodochrosite from Sweet Home mine, USA. J. Gajowniczek photo. Very sculptural silver from Batopilas. J. Gajowniczek photo. 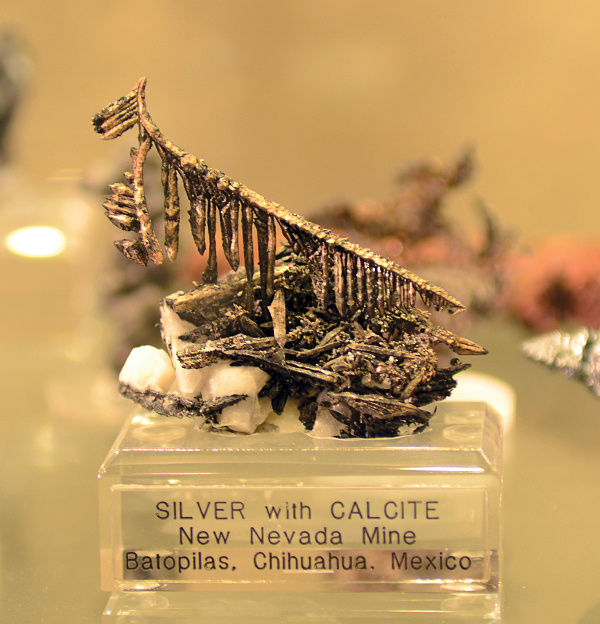 Brochantite from Milpillas, Mexico. J. Gajowniczek photo. Cute boleite thumbnail. J. Gajowniczek photo. 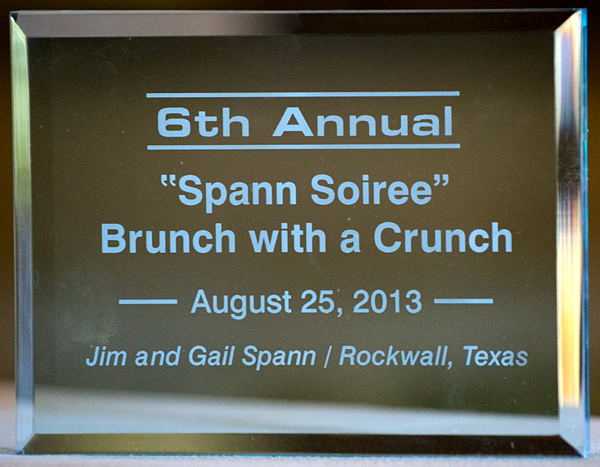 Last day in Dallas we went for 6th Annual Spann Soiree hosted by Gail and Jim Spann. J. Gajowniczek photo. Spann`s house. J. Gajowniczek photo. 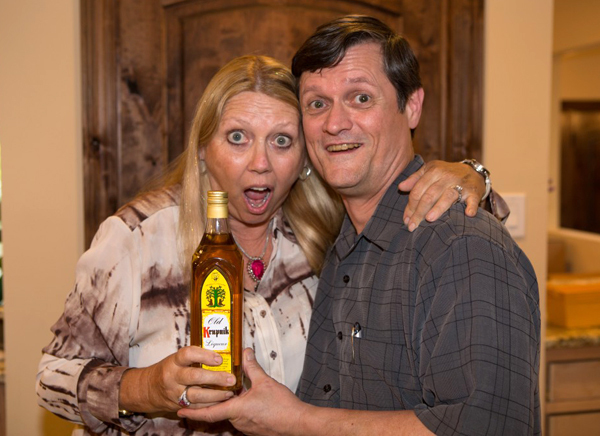 Gail and Jim with Krupnik :) J. Ralph photo. Party at Gail and Jim`s home. J. Ralph photo. 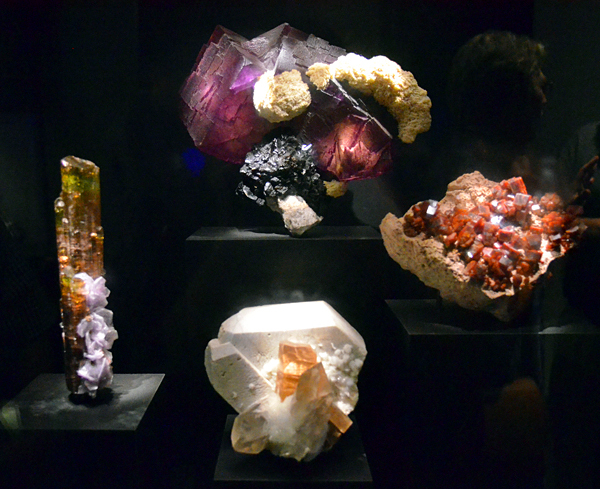 Guests admiring minerals in one of the mineral rooms. Spann`s house looks more like museum than a "normal house". J. Gajowniczek photo. Cat seems to enjoy the showcases with specimens too. J. Gajowniczek photo. One of many, many showcases. J. Gajowniczek photo. 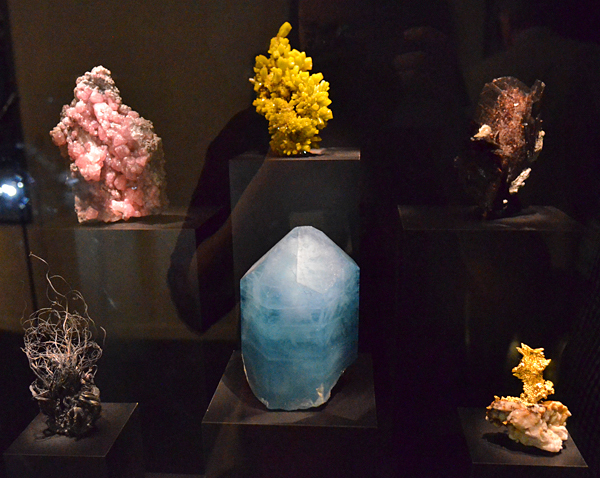 One of shelves with rhodochrosite specimens from South Africa. J. Gajowniczek photo. 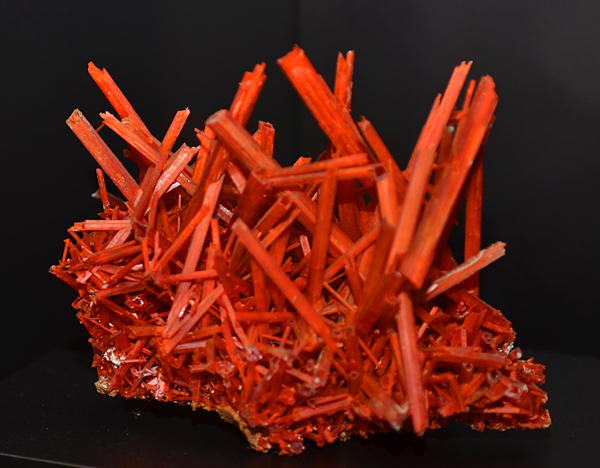 Spectacular rhodochrosite from N`Chwaning, South Africa. J. Gajowniczek photo. Great apatite from Panasqueira, Portugal. J. Gajowniczek photo. Superb pyrargiryte from Germany. J. Gajowniczek photo. Amazing silver from Batopilas, Mexico. J. Gajowniczek photo. 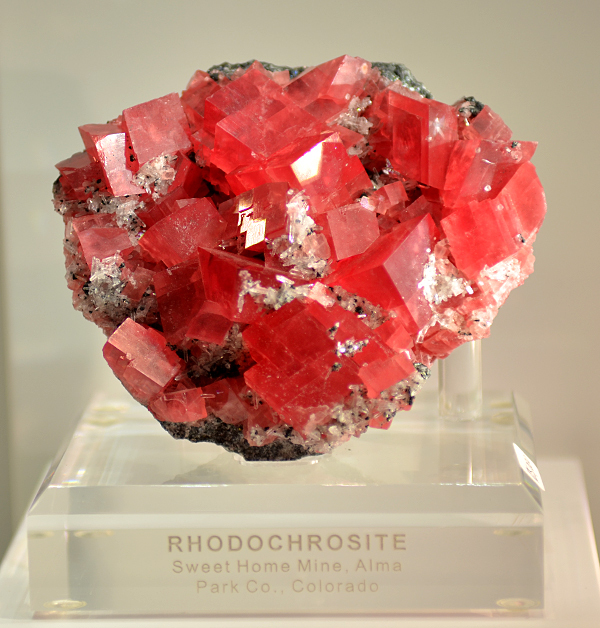 Classic rhodochrosite from Sweet Home mine, USA. J. Gajowniczek photo. 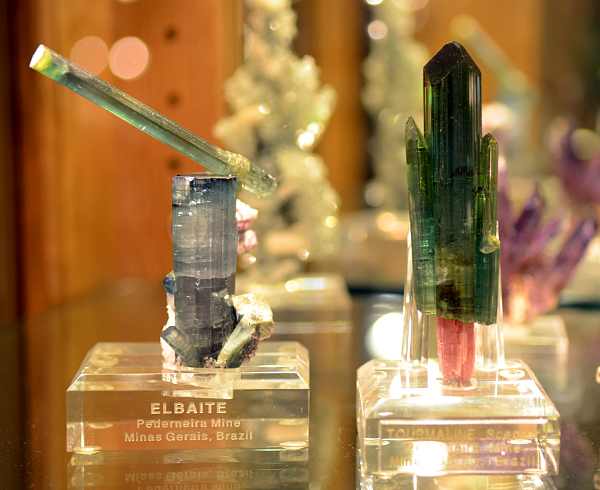 Great tourmalines from Pederneira mine, Brazil. J. Gajowniczek photo. One of the showcases with thumbnails and miniatures. J. Gajowniczek photo. Thumbnails and miniatures. J. Gajowniczek photo. Cute wulfenite from Los Lamentos, Mexico. J. Gajowniczek photo. Map of N America showing our way from Dallas to Phoenix. Google maps. 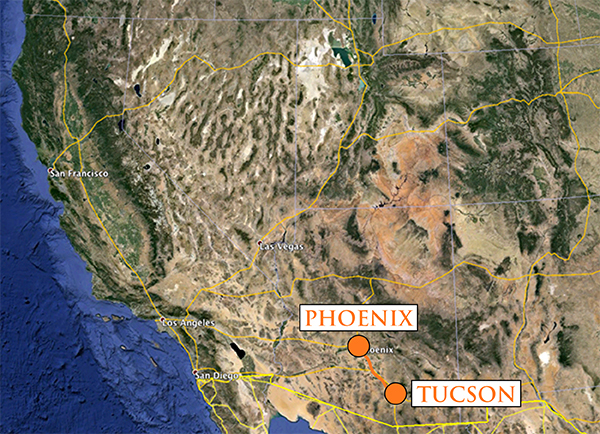 Map of N America showing our way from Phoenix to Tucson. Google maps. 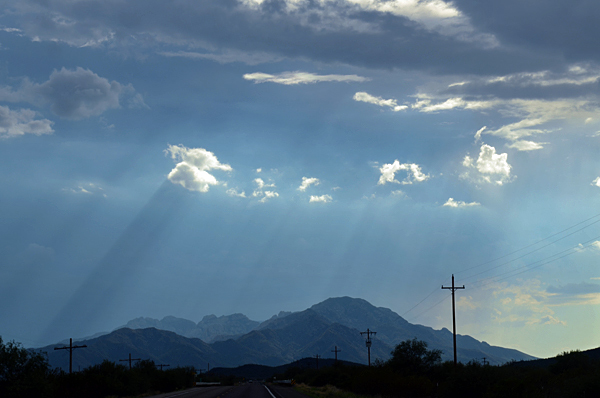 Going thorugh Sonora Desert, incredible lighting. J. Gajowniczek photo. 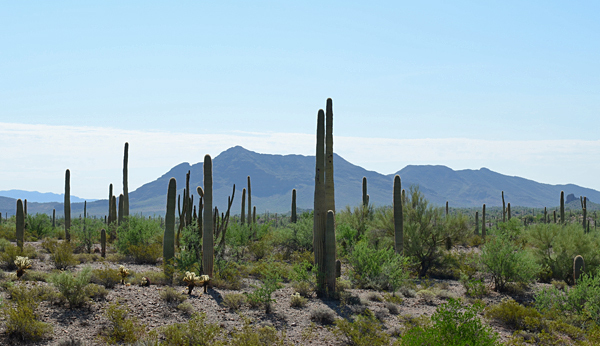 Hills with houndreds of Saguaro cacti. J. Gajowniczek photo. 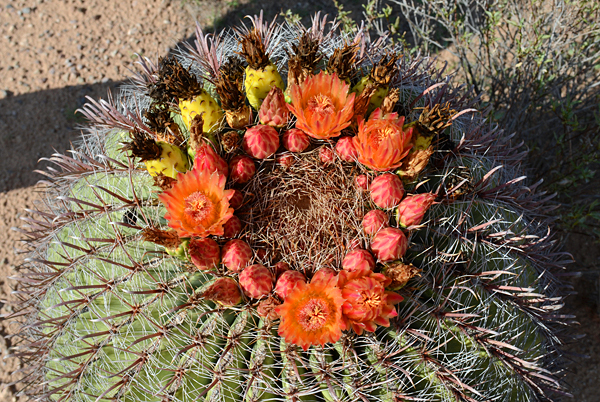 Blooming cactus. J. Gajowniczek photo. Blooming cactus wit Asia. J. Gajowniczek photo. 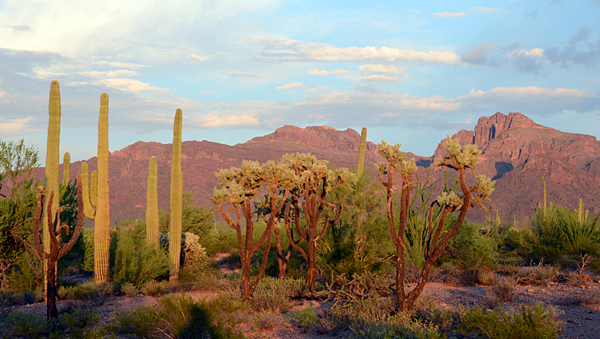 Plants of the desert. J. Gajowniczek photo. 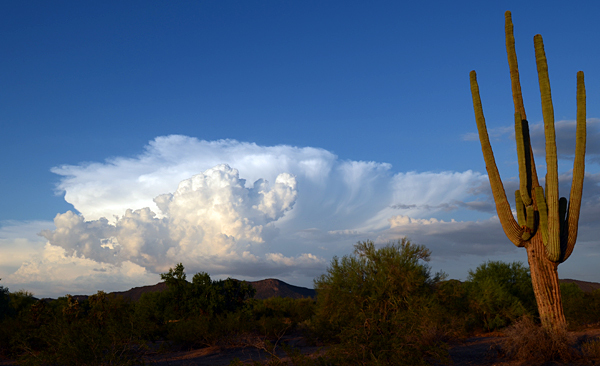 Picturesque clouds and Saguaro cactus. J. Gajowniczek photo. 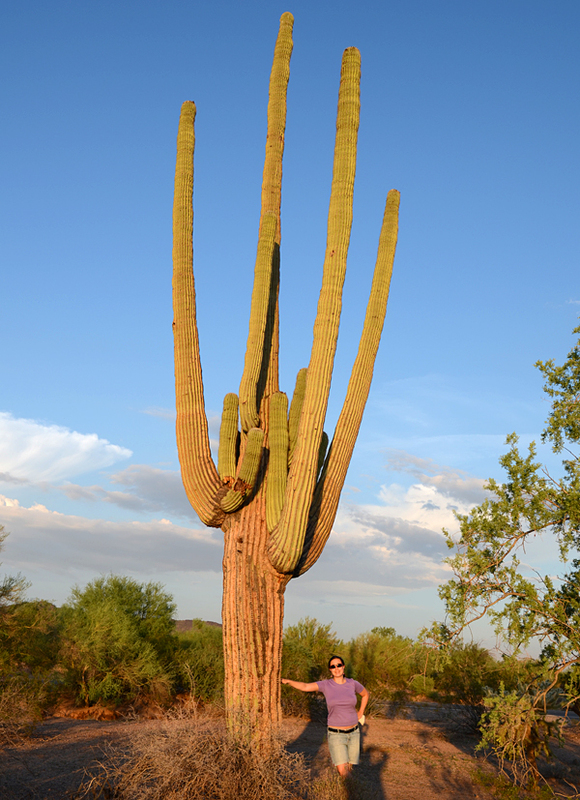 Asia with big Saguaro. 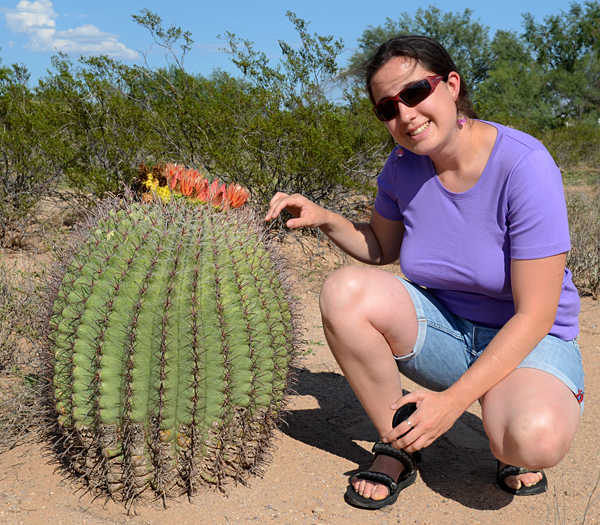 These cacti grows only 2-3 cm/year and reaches 5-15 m. J. Gajowniczek photo. 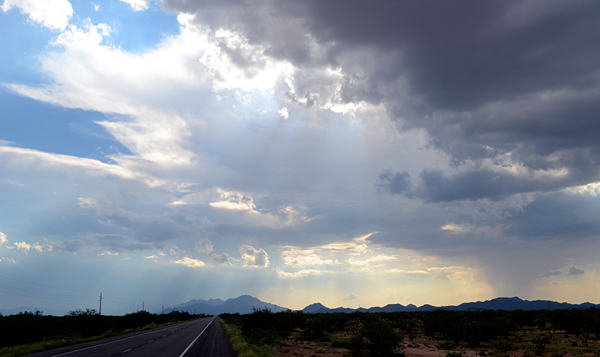 Next on our way was famous Ajo. Google maps. 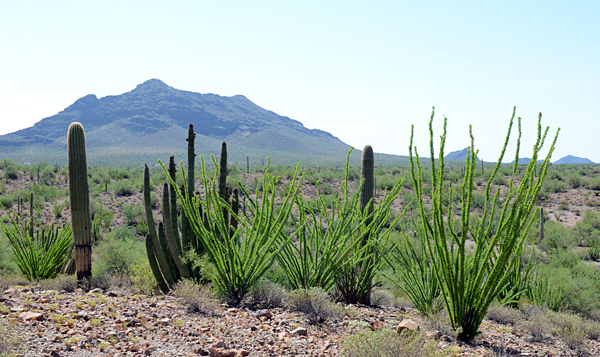 We visited Organ Pipe Cactus Reserve near Ajo. J. Gajowniczek photo. 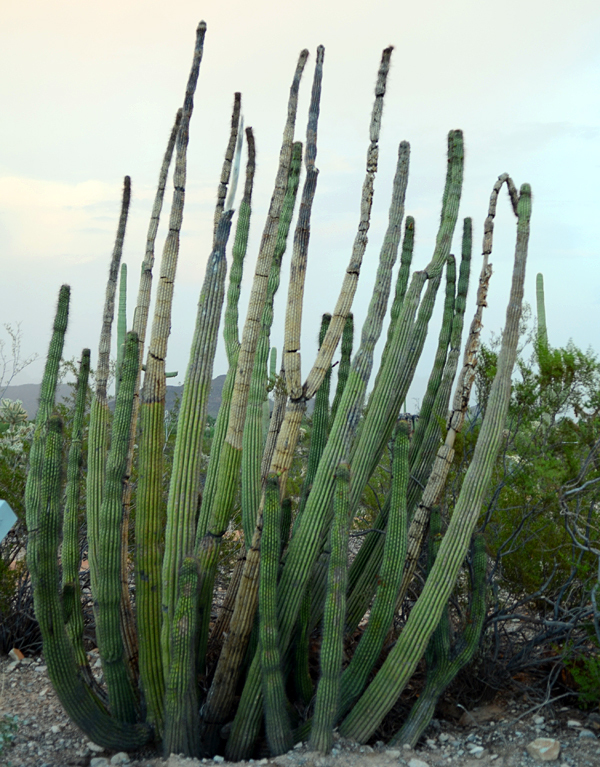 Organ pipe cactus - a large cactus rarely found in the United States but common in Mexico. J. Gajowniczek photo. 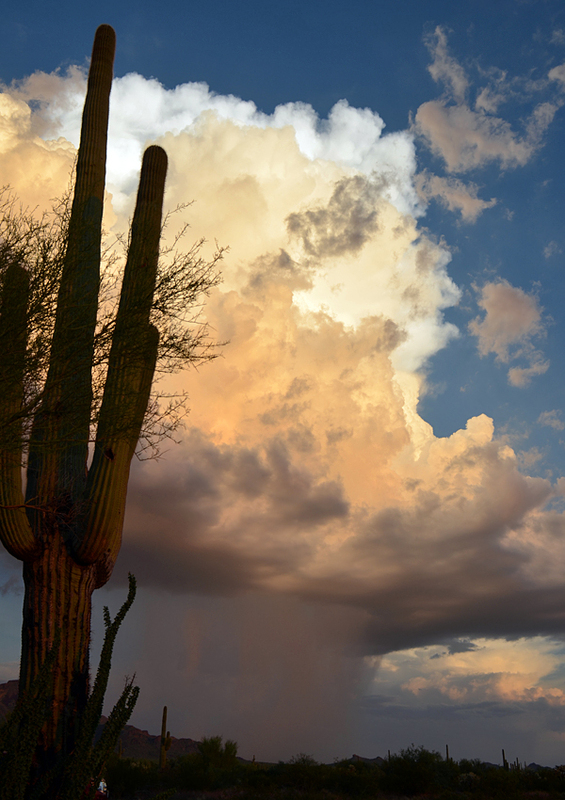 Saguaro, clouds and heavy rain on the desert. J. Gajowniczek photo. Classic landscape, only John Wayne is missing :-) J. Gajowniczek photo. 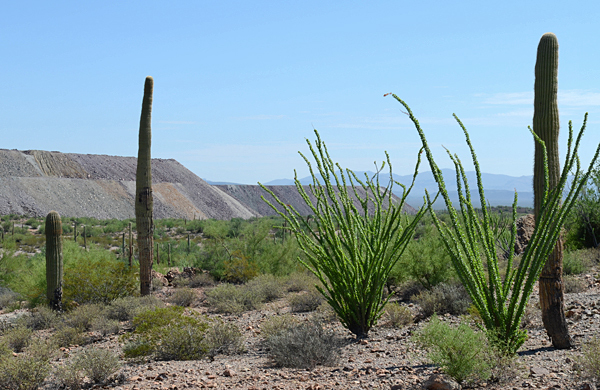 Ajo is a small town on desert with huge mine pit and dumps. J. Gajowniczek photo. 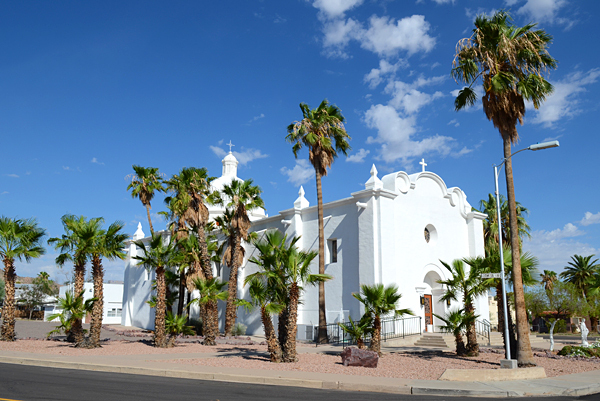 Spanish style church in Ajo. J. Gajowniczek photo. 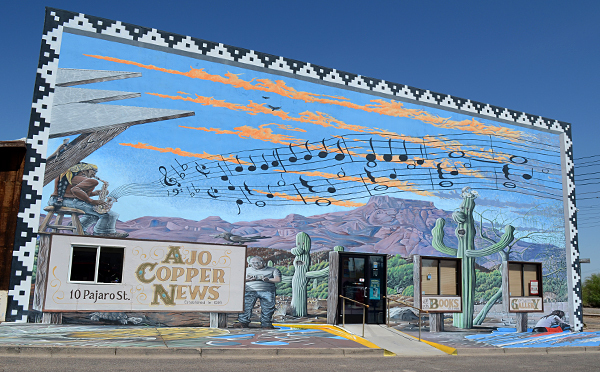 Building of the local newspaper (Ajo Copper News). J. Gajowniczek photo. 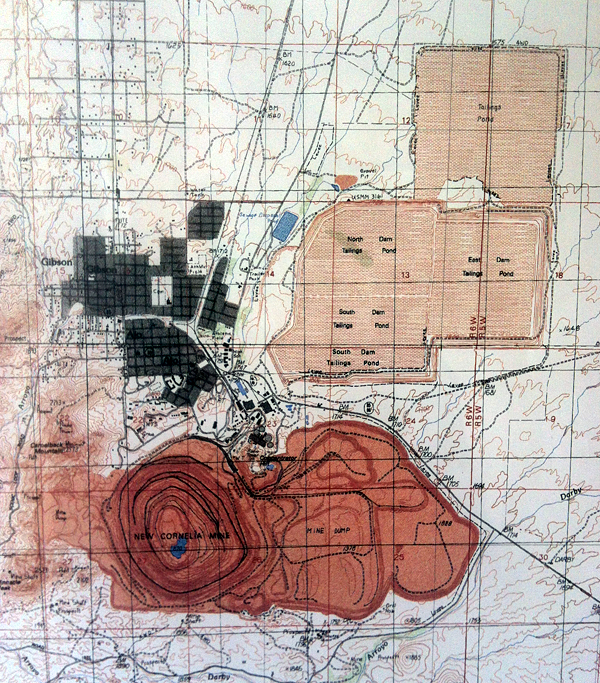 Map of the town (small in the center), huge mine and dumps (darker brown) and tailings ponds (light brown). Tailings ponds, very dangerous for the environoment. J. Gajowniczek photo. Tailings ponds, very dangerous for the environoment. Google maps. 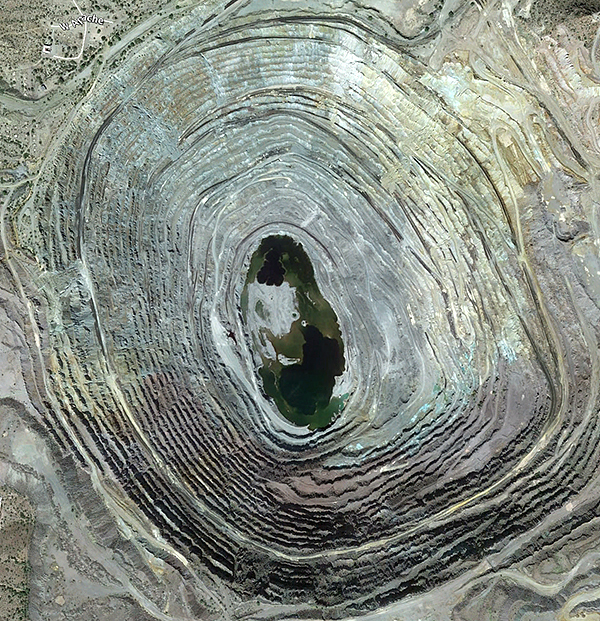 Panorama of the open pit. J. Gajowniczek photo. Colorful open pit with Cu and Fe oxides and carbonates - to get closer to the mine we decided to find a road from the back of the pit. J. Gajowniczek photo. It was a very beautiful drive. Landcsapes surrounding the pit. J. Gajowniczek photo. Interesting plate on the desert. J. Gajowniczek photo. Off-road driving. J. Gajowniczek photo. Plants close to the mine. J. Gajowniczek photo. Plants and dumps. J. Gajowniczek photo. View of the pit from the back, it is really huge. J. Gajowniczek photo. Part of the pit, note incredible turquoise color of the water in small ponds. J. Gajowniczek photo. 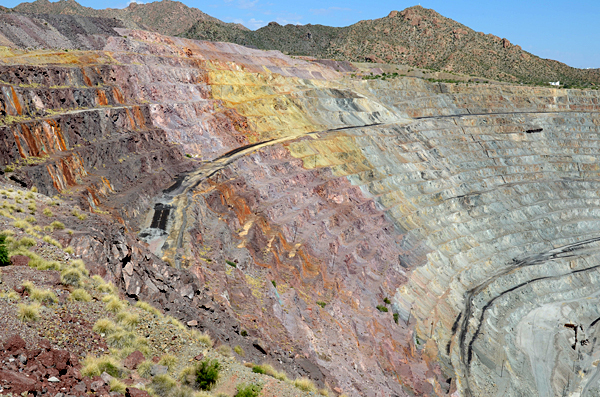 Colorful oxidation on the mine pit. J. Gajowniczek photo.